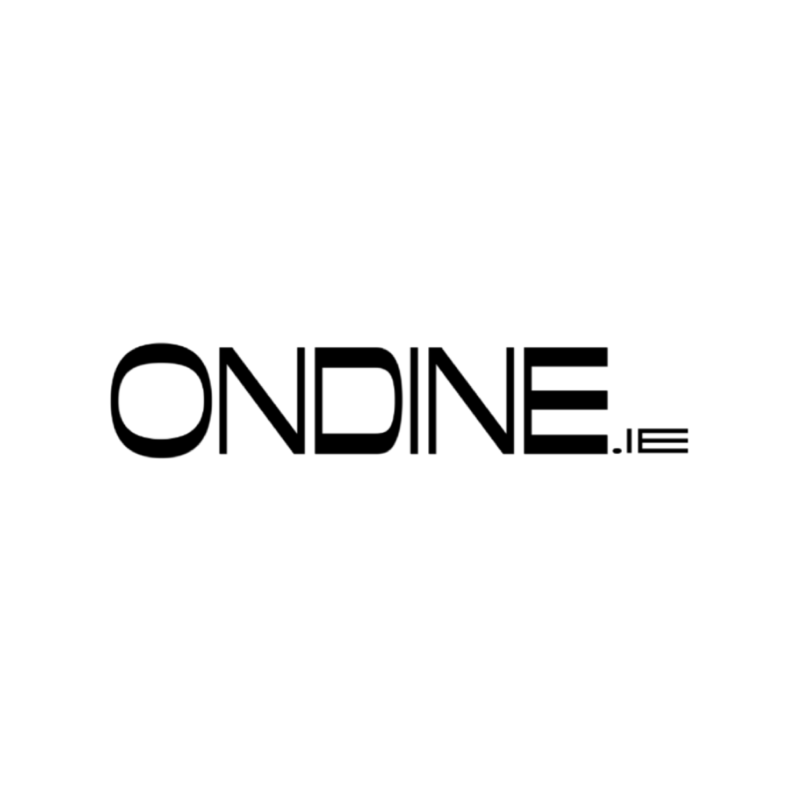 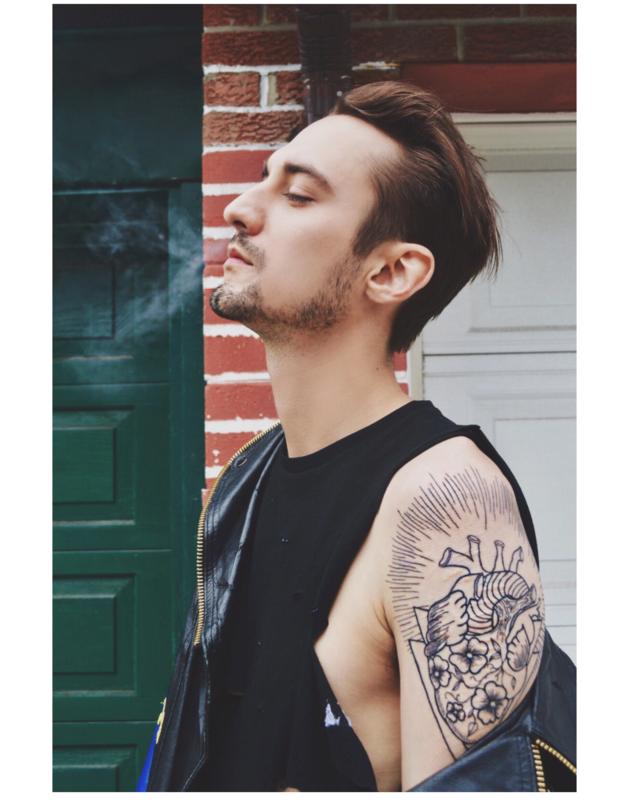 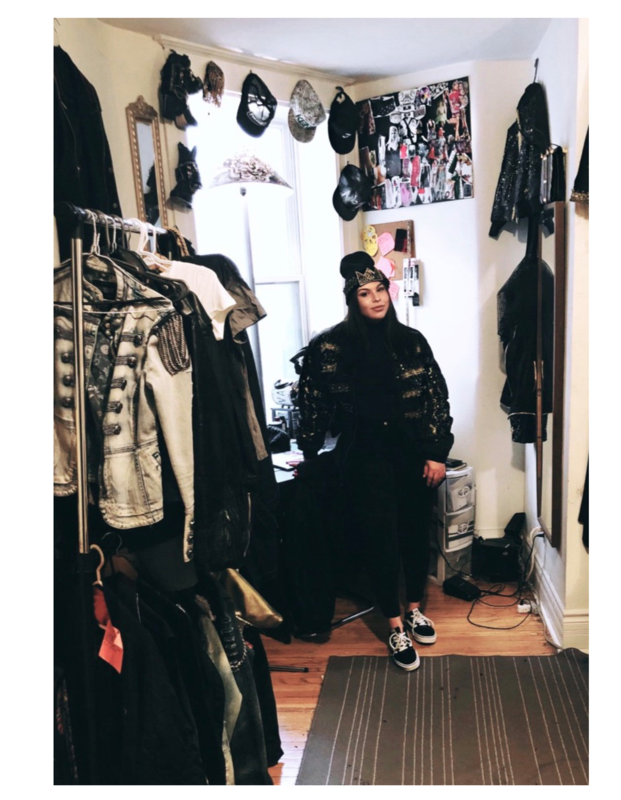 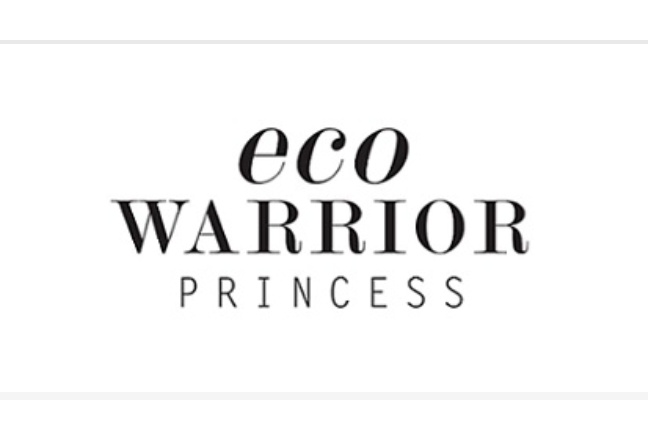 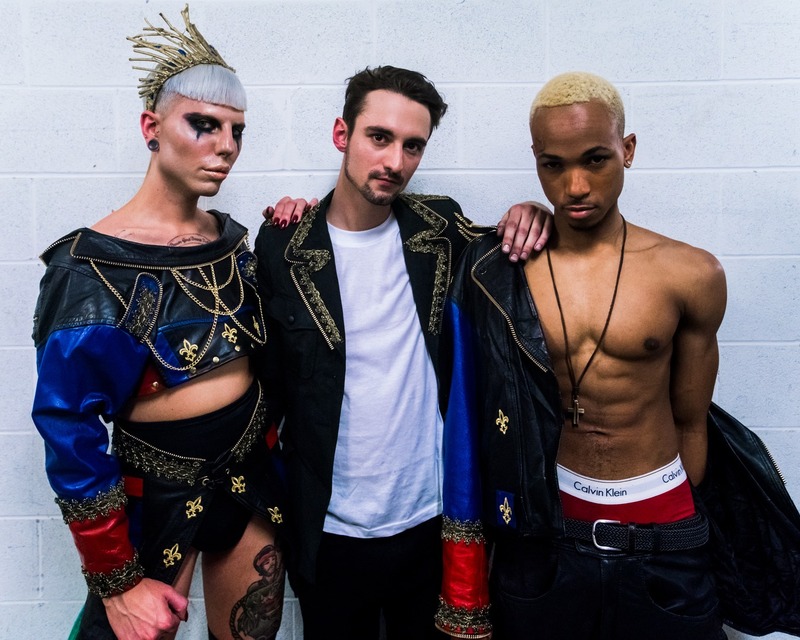 Fashion designer specializing in recycling vintage+ thrift clothing with a high fashion vibe. 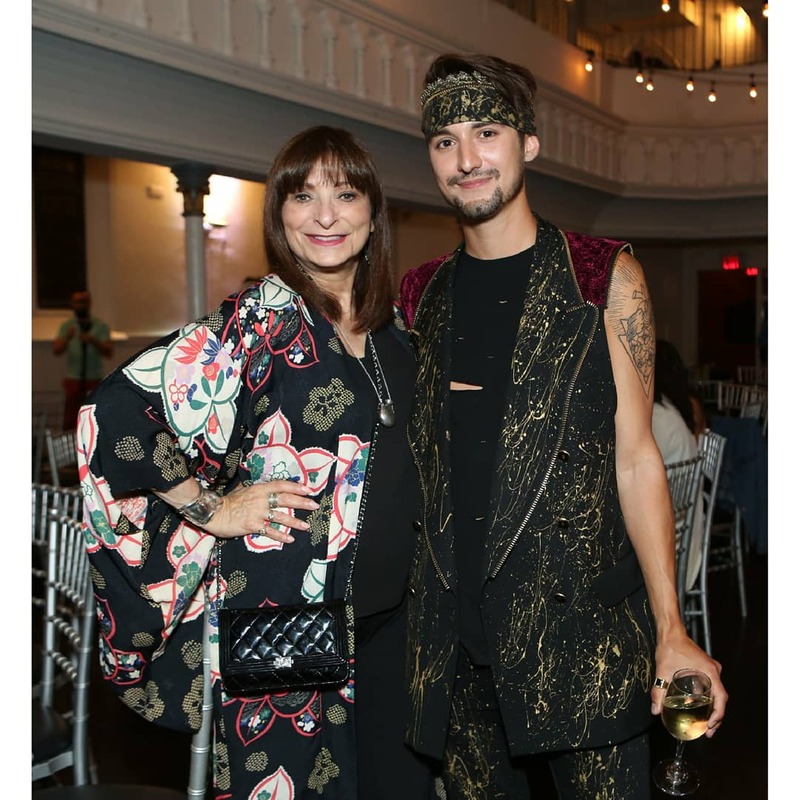 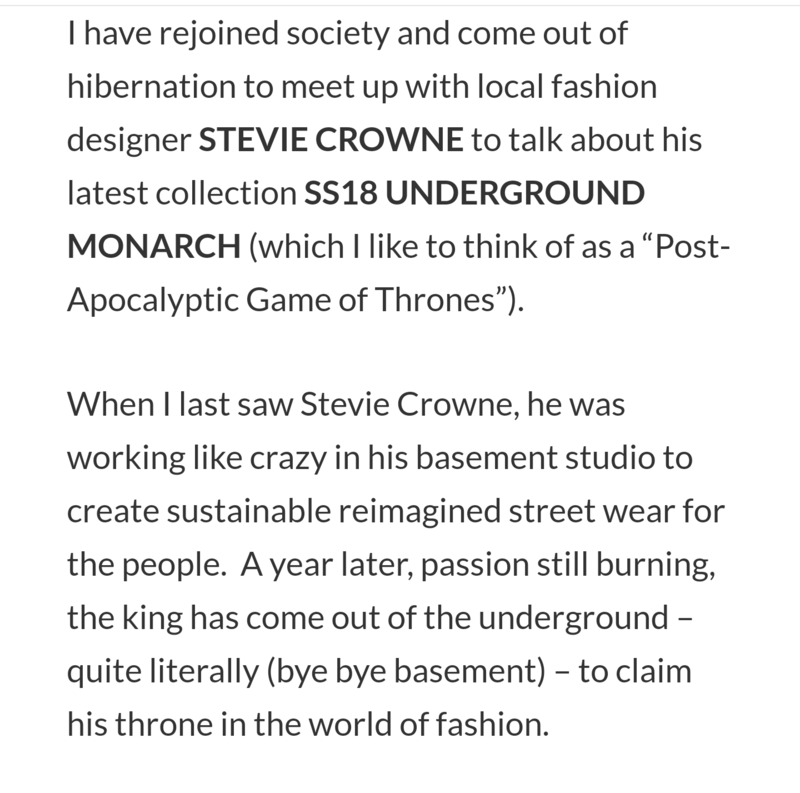 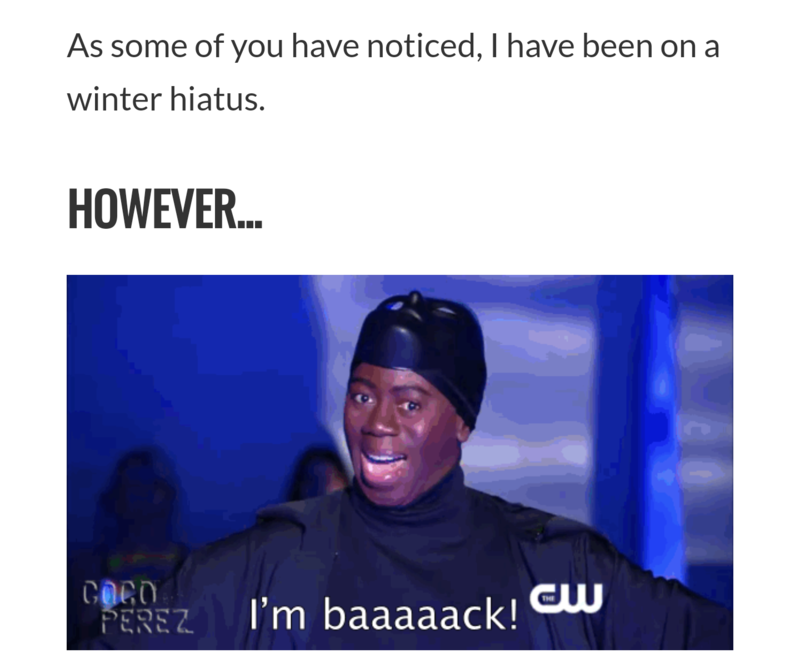 This has been a very busy season transitioning after my SS18 runway collection. 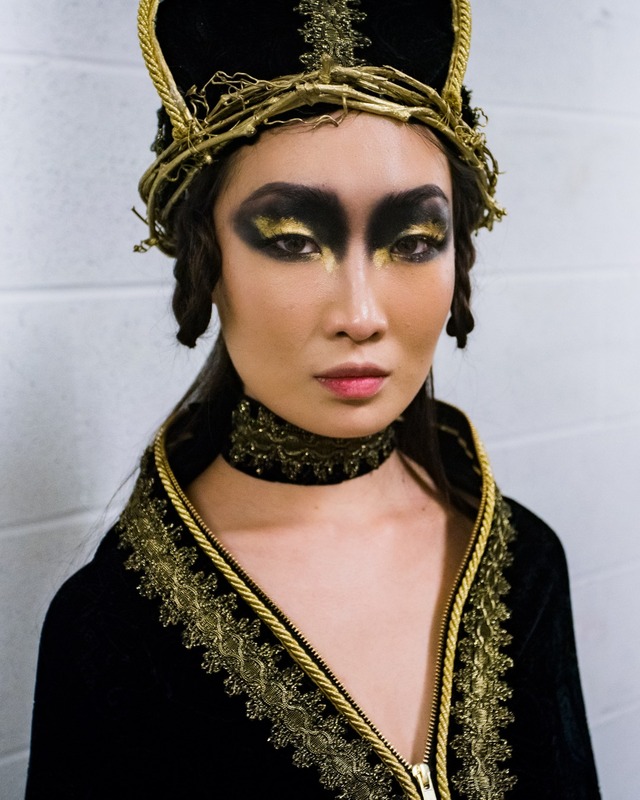 I find after each season there is a boatload of great custom orders that come in, sometimes inspired from the runway or directly from my clientelle’s imagination. 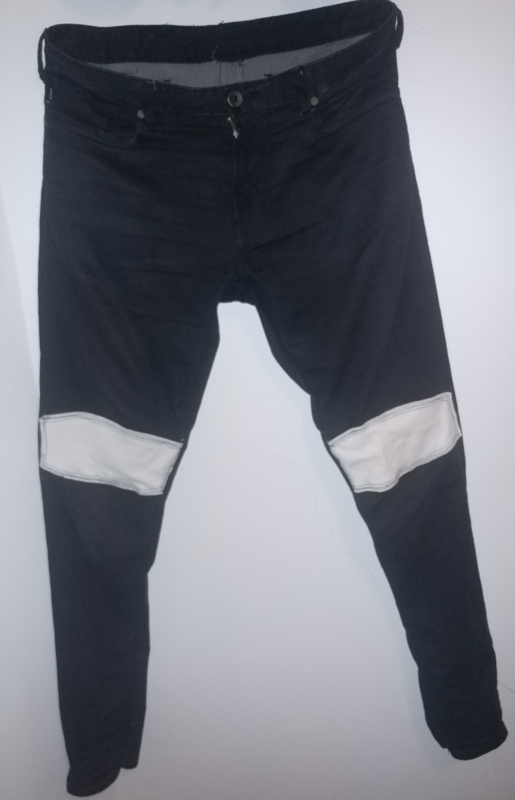 Below are some of my favorite projects I have completed in the last few months. 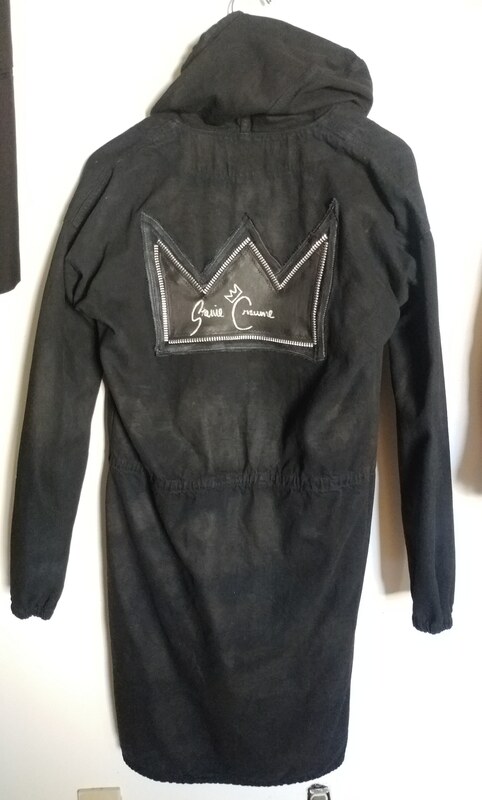 This is a matching denim set directly inspired by the Underground Monarch collection. 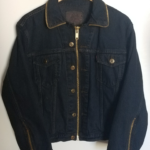 The client supplied the denim shirt as well as the jeans. 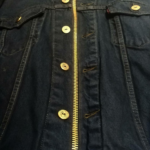 I embellished the collar with gold zipper trim and flap pocket with a small gold chain. 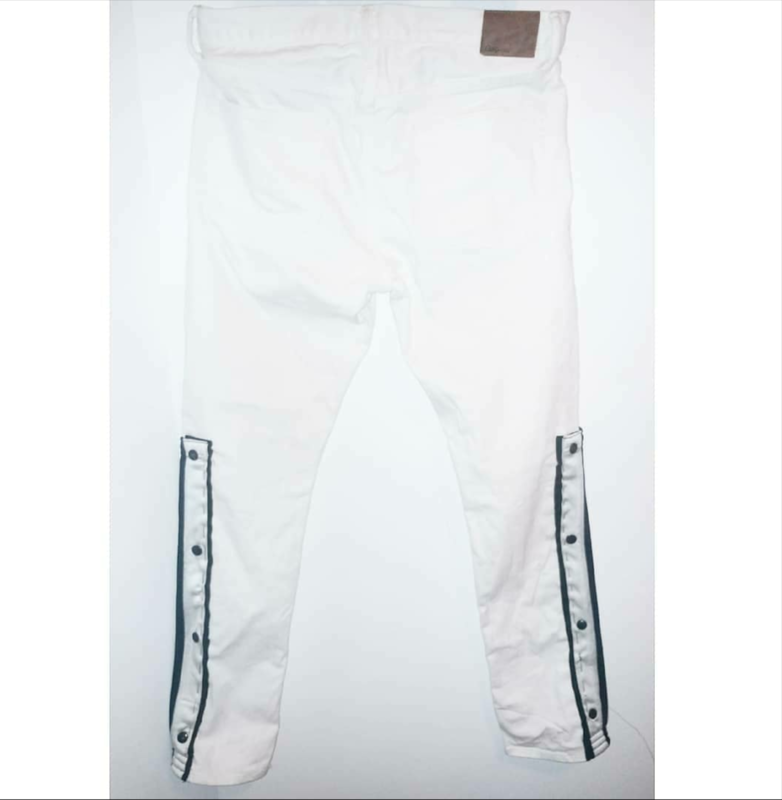 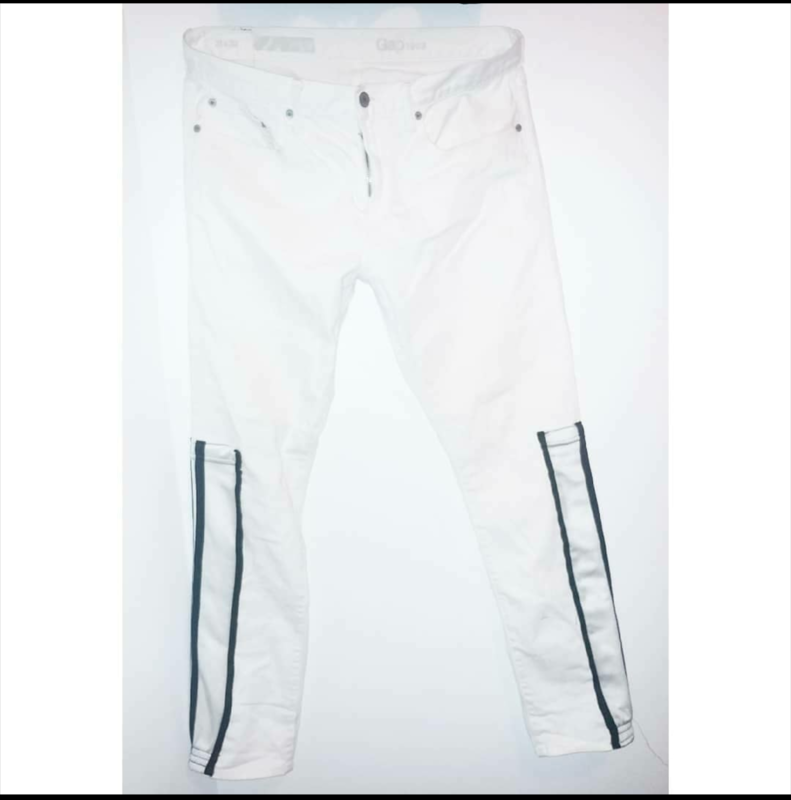 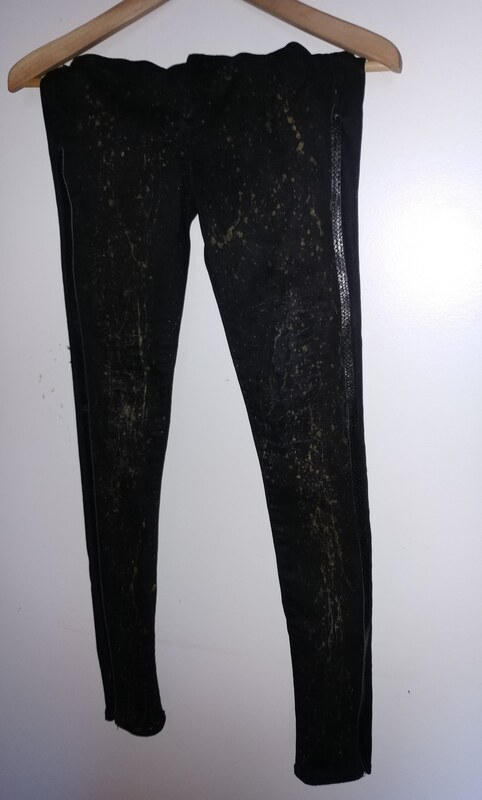 The pants were a diffusion remake from the pants shown on the runway in April. 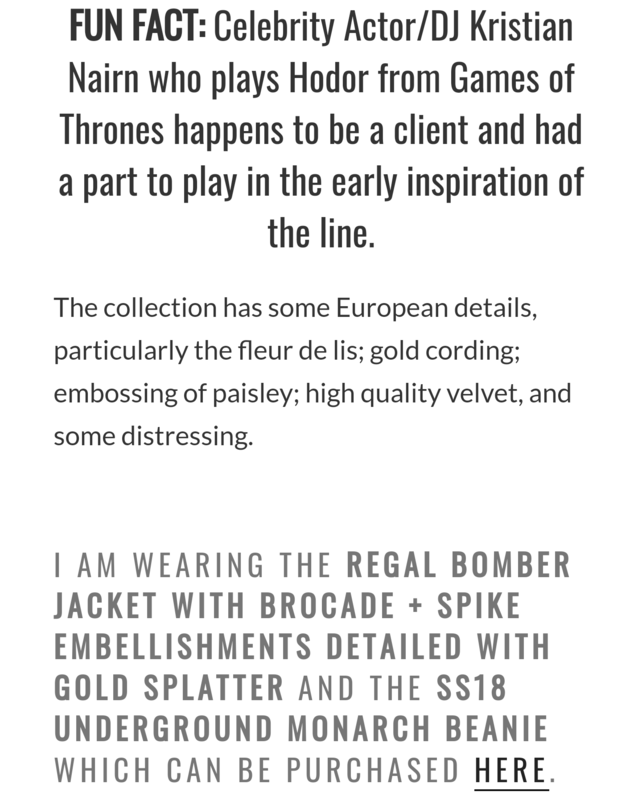 The next two garments were commissioned by the same client in Montréal, who supplied another two sweaters for me to rework. 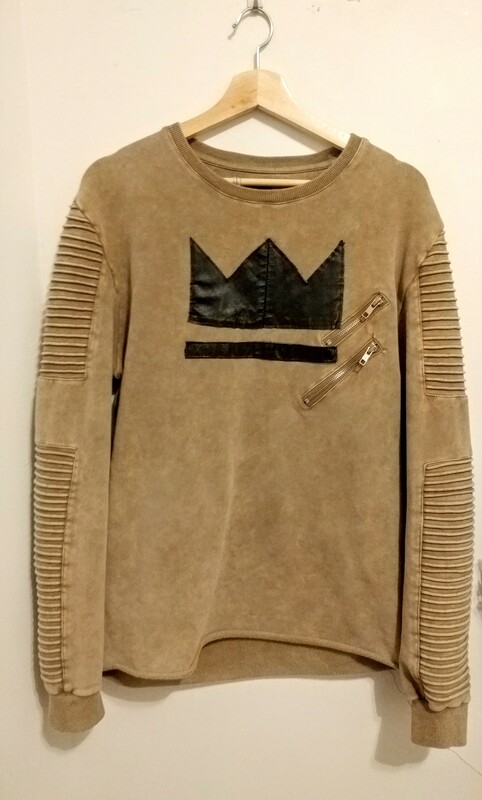 The beige sweater was given a signature crown patch and the velvet hoodie was dip-dyed. 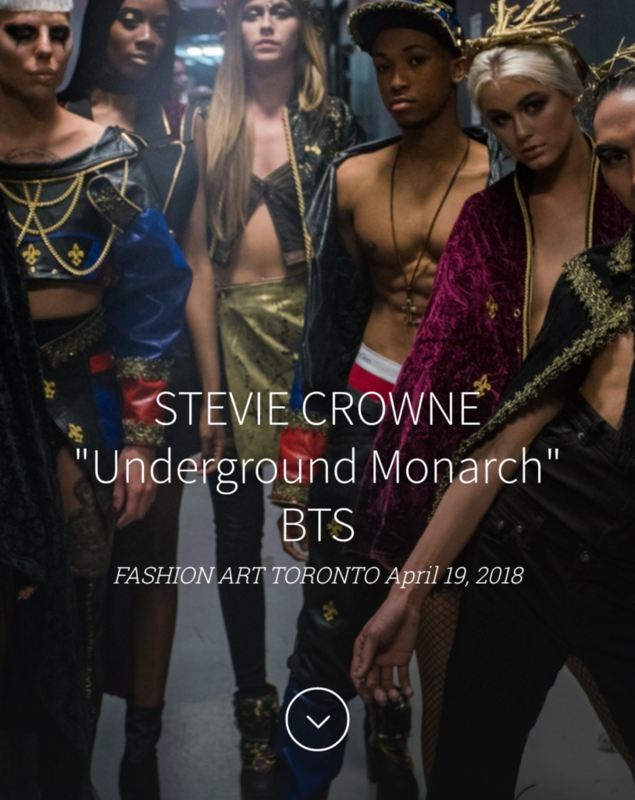 This top and bottom set was also inspired by Underground Monarch, except it was white garments we chose to work with, incorporating the gold zipper and brocade details. 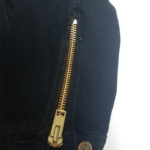 Streetwear denim merged with old sportswear shorts with this hybrid creation. 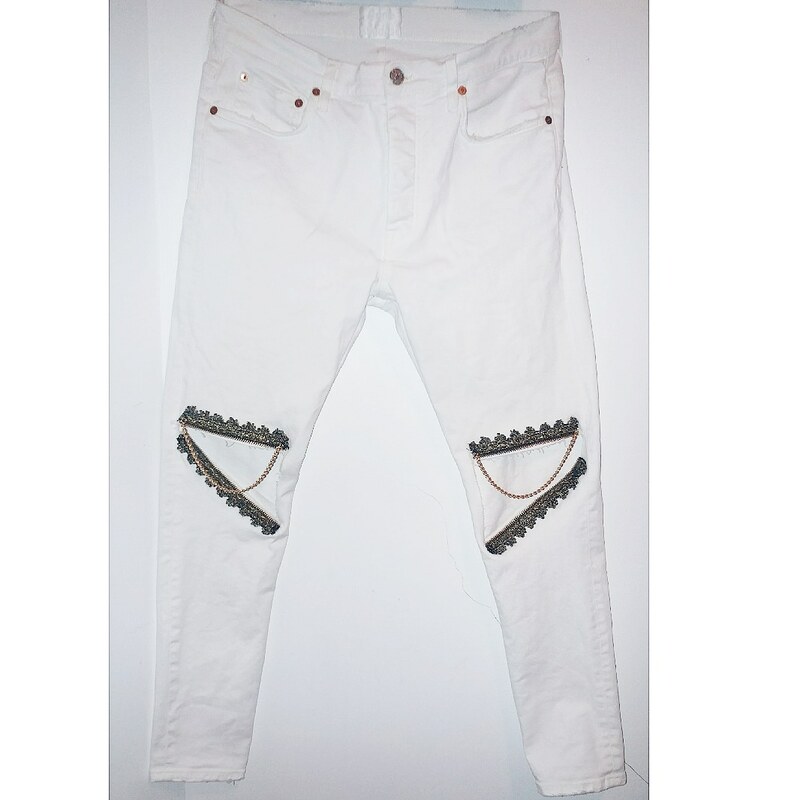 Inspired by D.I.Y patchwork trends, this pair of denims had zig zag stitched knee pads + pockets inserted from the sleeves of the white Acne Shirt seen earlier in this post. 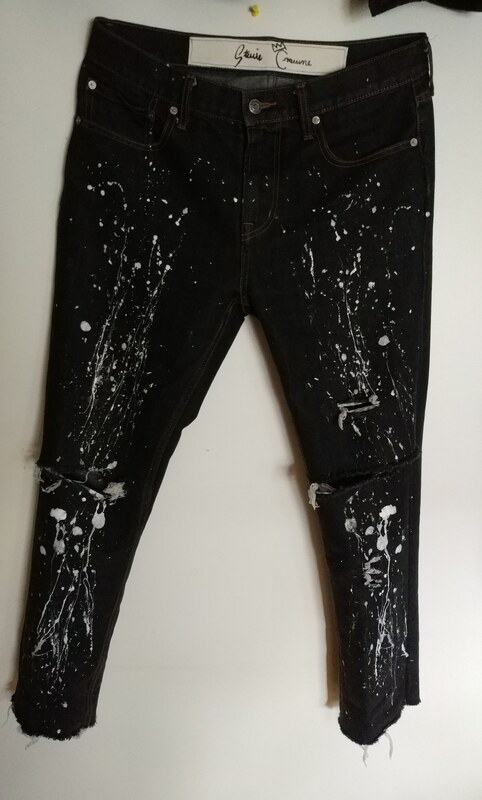 These old and unworn denims were tailored and splattered. 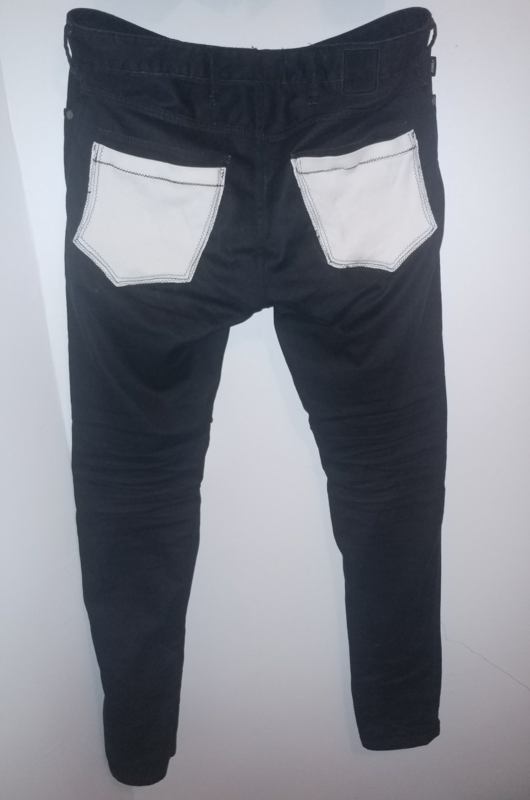 What I love about these denims is they were a inspired look from the SS18 line before I paneled them with blue denim to fit the size of the client. 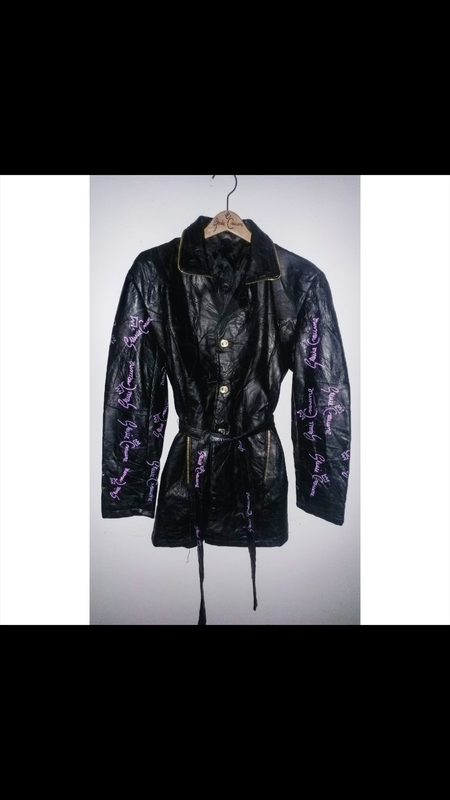 Above is a leather quilted leather jacket/dress with pink signature prints on the sleeve, detailed with gold zippers and buttons. 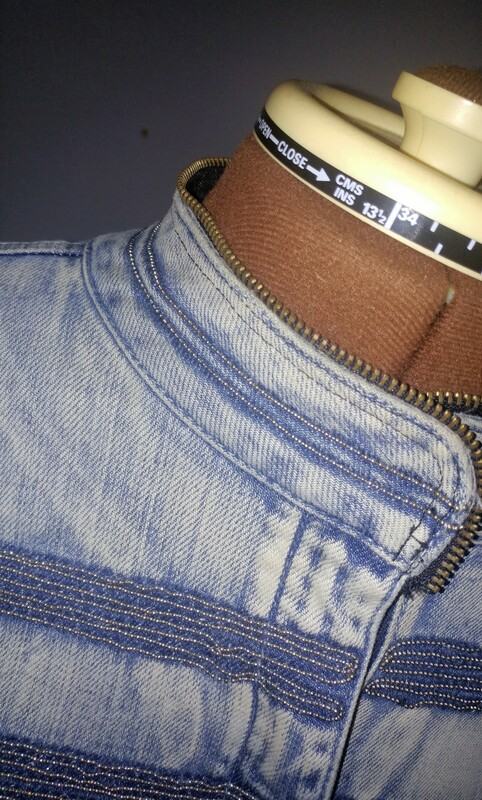 From the cutting table. 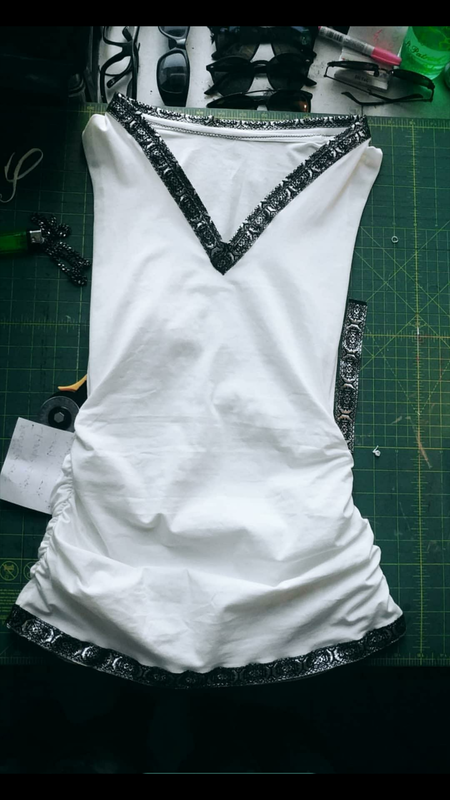 A white body-con dress with silver and black jacquard trim. 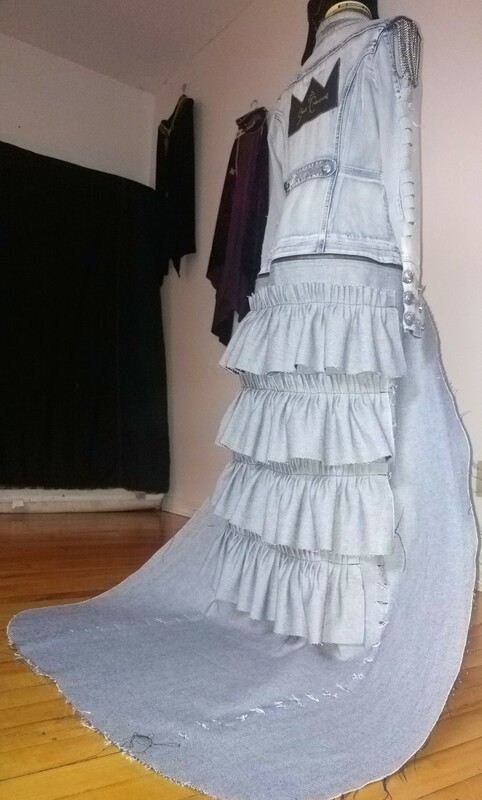 It merges casual with a hint of elegance. 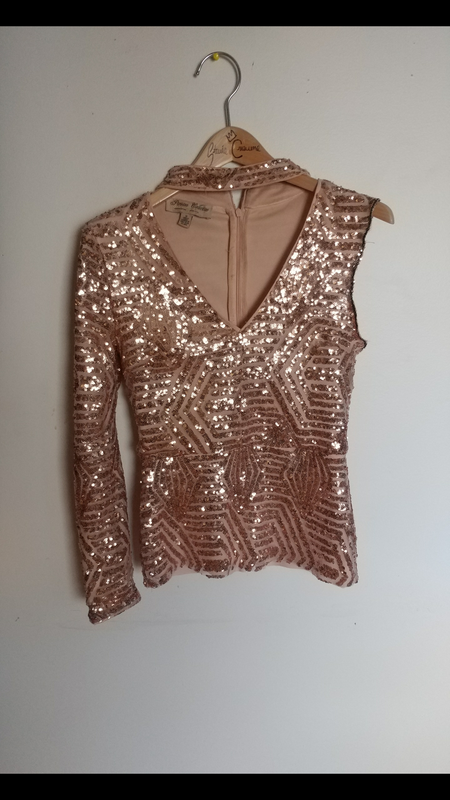 This was a long plain sequin dress before I hemmed it and decided to incorporate an asymmetric detail for the sleeves. 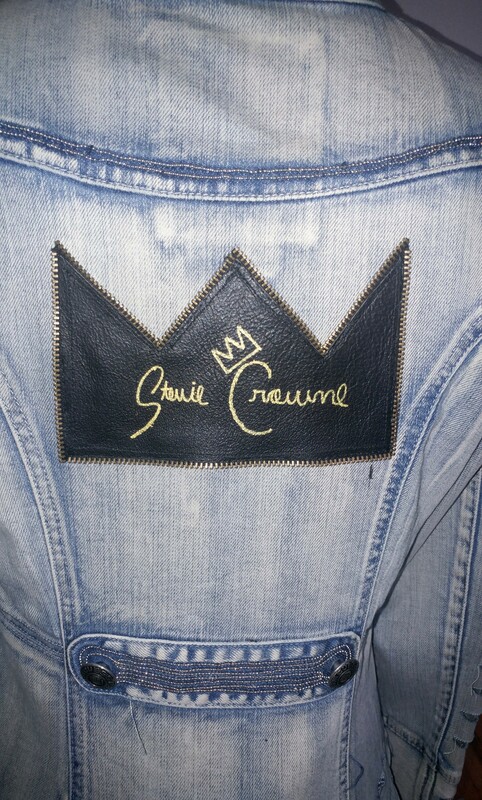 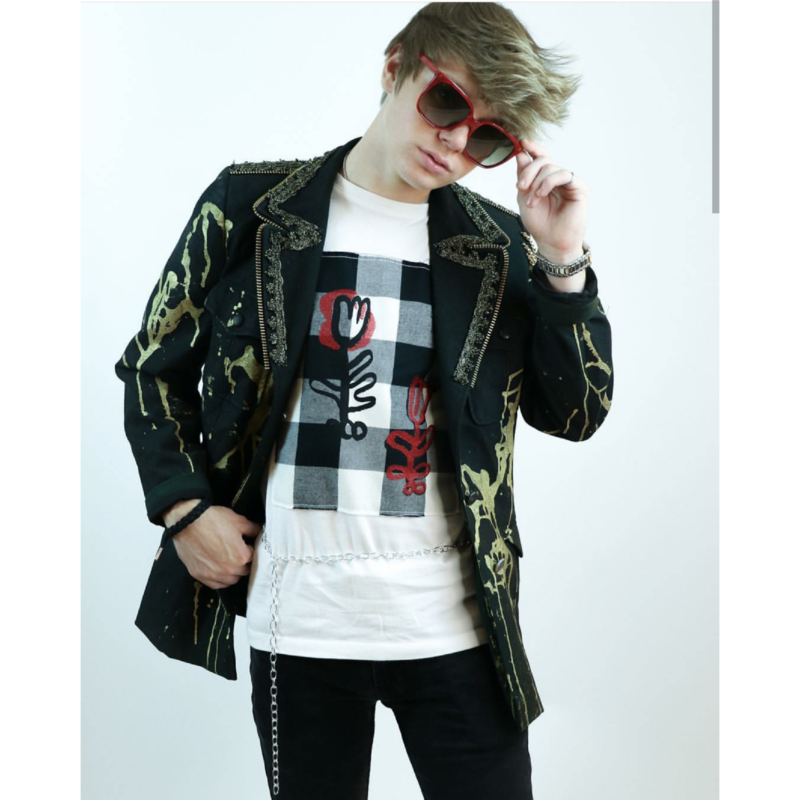 This is an example of a classic dyed denim jacket with pyramid studs, silver chain detail alongside a back center signature crown patch. 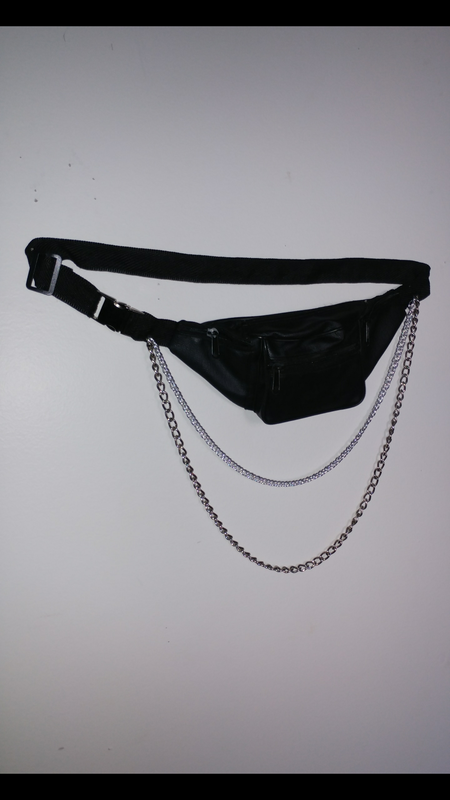 Here is a fanny pack I embellished with two silver chains and added a matching buckle. 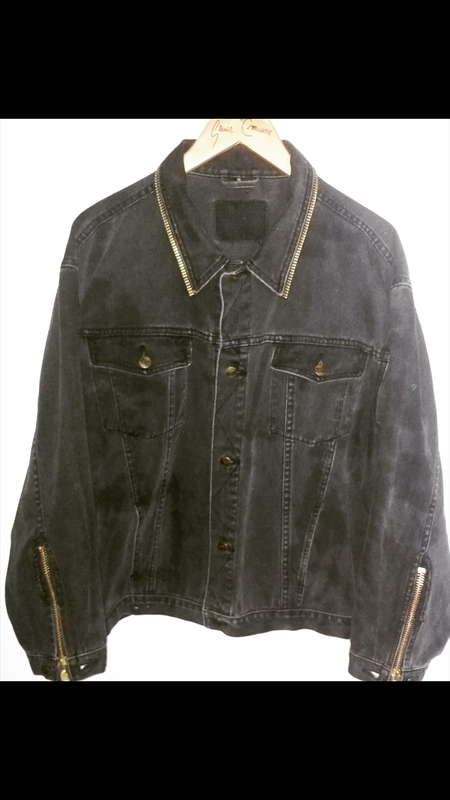 Another classic denim with added gold zippers on the sleeves alongside the details. 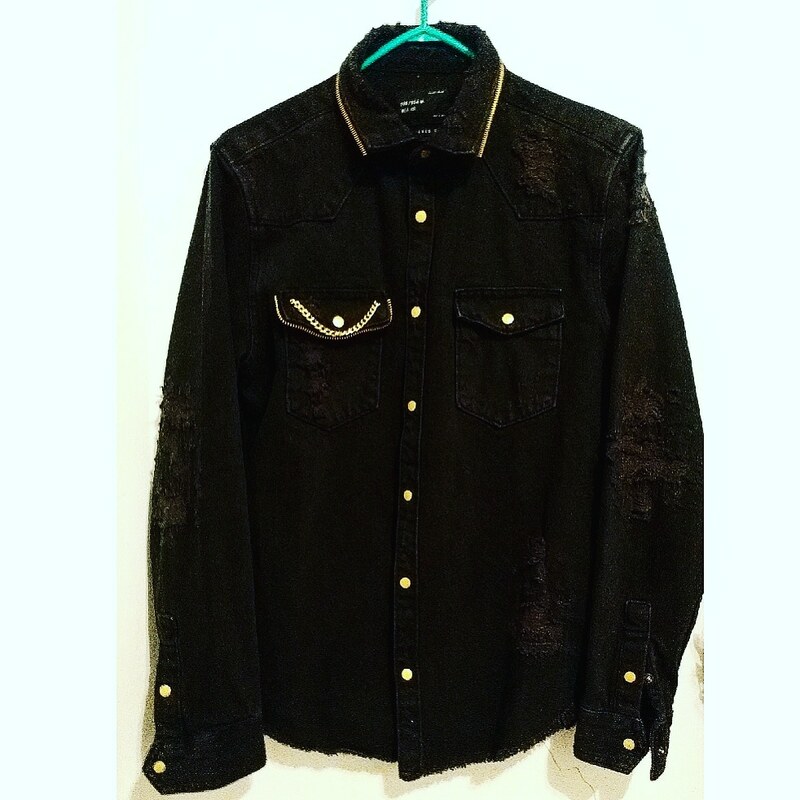 Black cotton shirt, splattered and with a center crown patch made from recycled embossed leather. 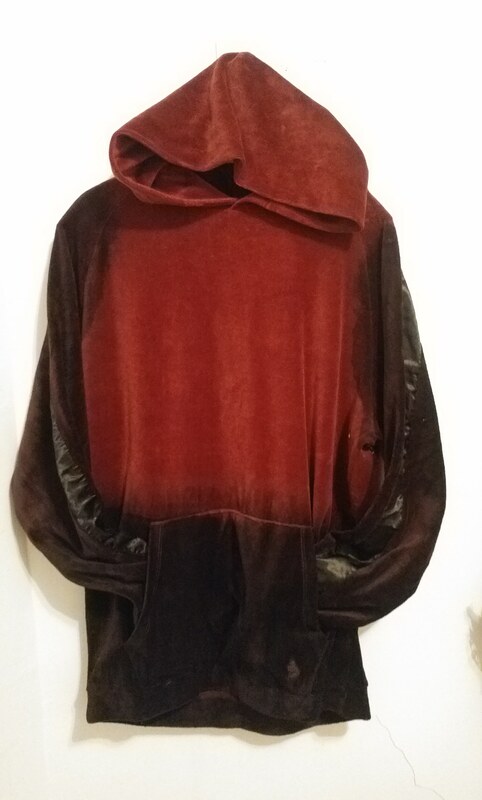 One of the more colorful commissions this season, this was a brown leather dress I separated, tailored, and embellished with black chains. 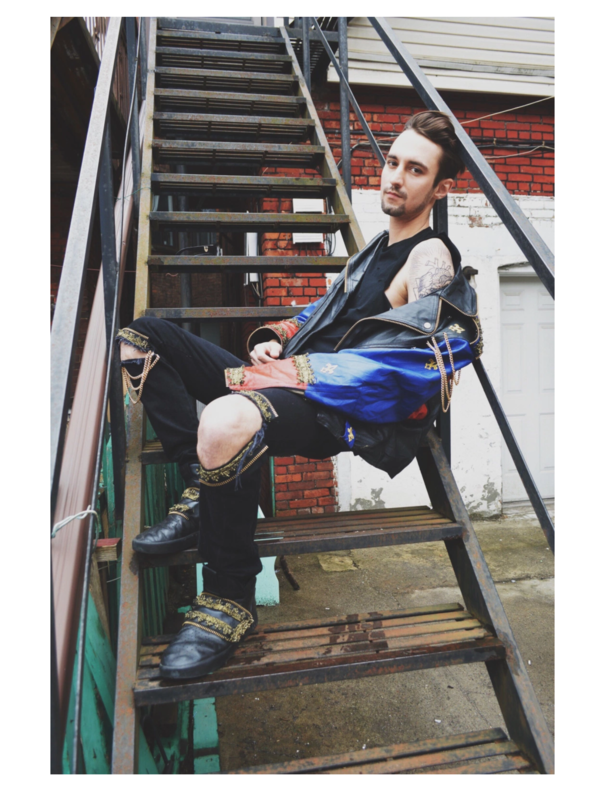 Custom harness from scratch for Gay Pride season. 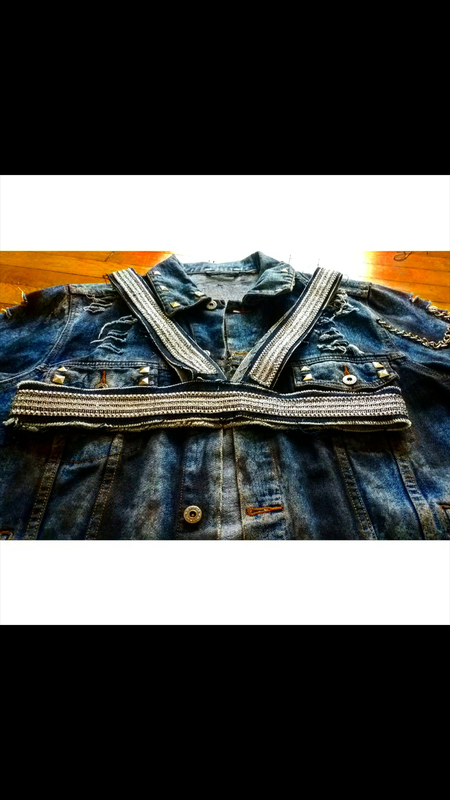 Denim harness and embellished with silver details. 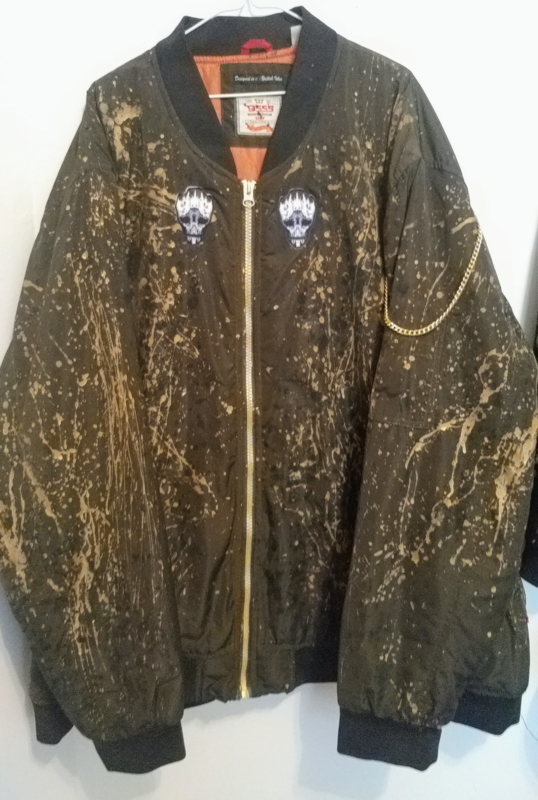 Custom two-tone splattered jacket with FW18 Skull Patches and arm chain detail. 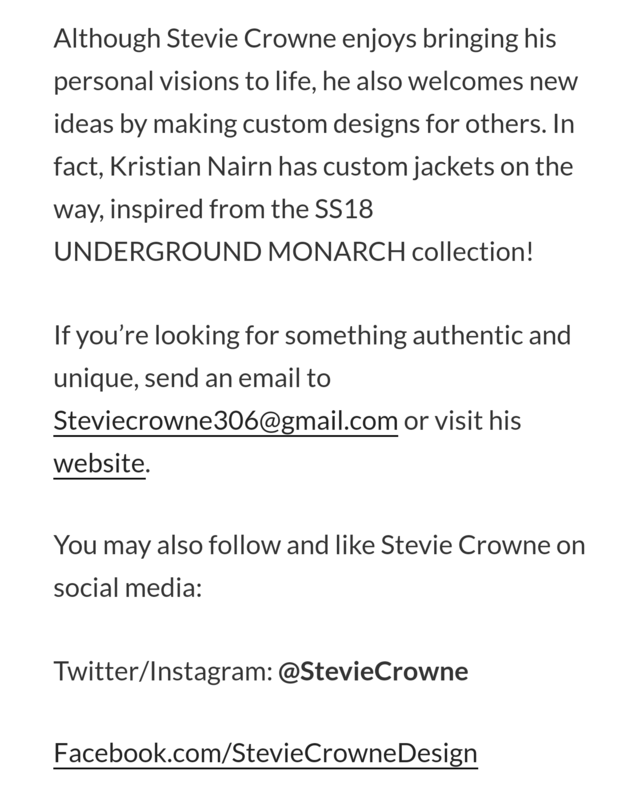 It feels like it has been a few months since I have uploaded a blog showcasing all of the commission’s I have recieved from my clients. 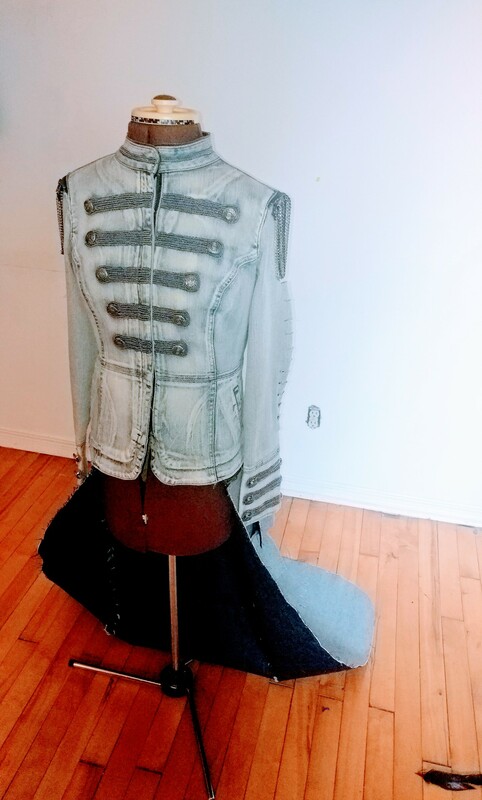 First, I must show one of the pieces I am most proud of! 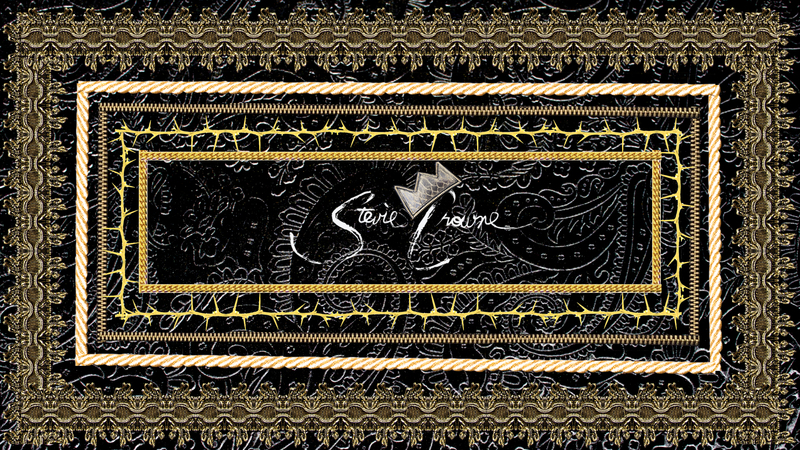 One of my favorite creations this year! 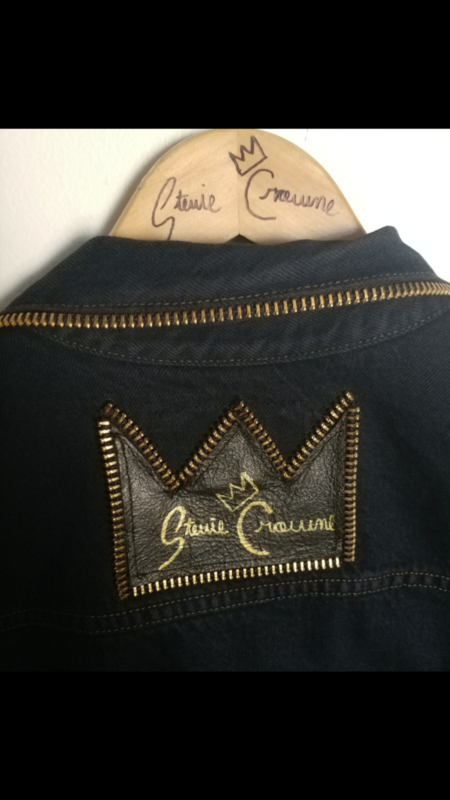 This denim features a removable 50″ denim train with ruffles, distressing, shoulder chain detail, and a brass zipper trimmed signature crown patch on the back. 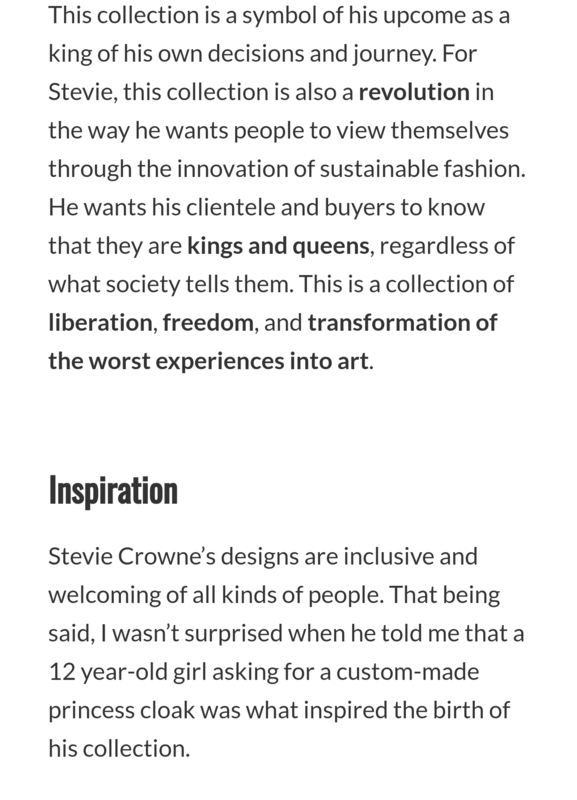 Below are pieces I have created under a collective/elevated vision. 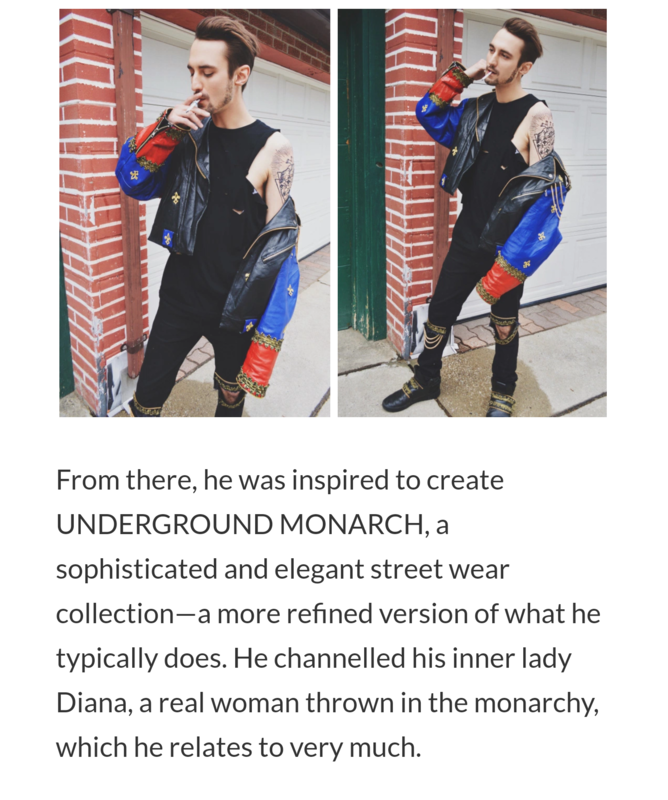 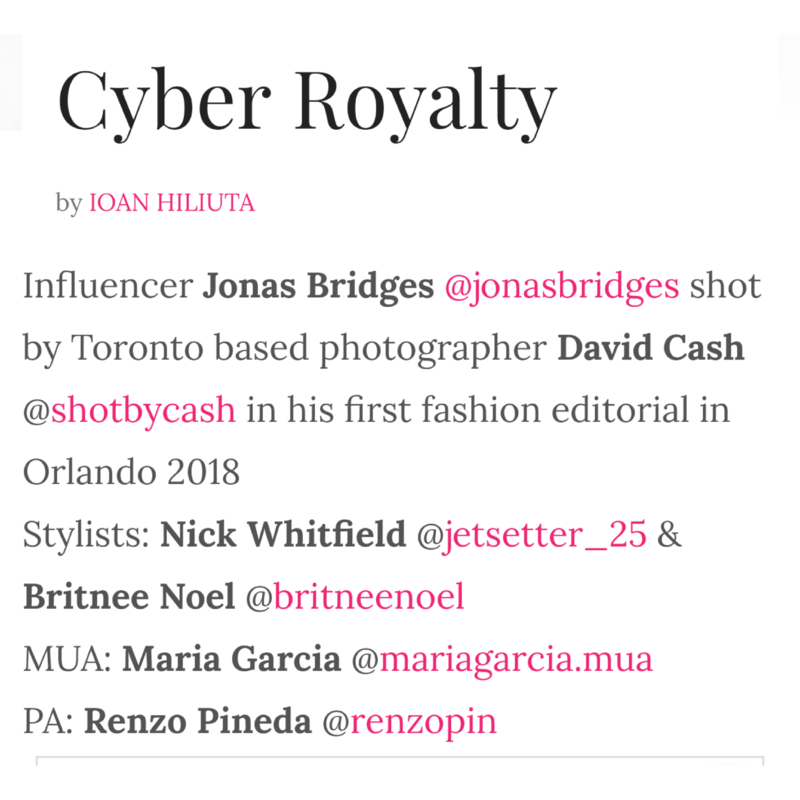 A rarity as a design creative is to give power to your target market- it is a surprise at times, and at other times it is a more wearable version of what I would normally do. 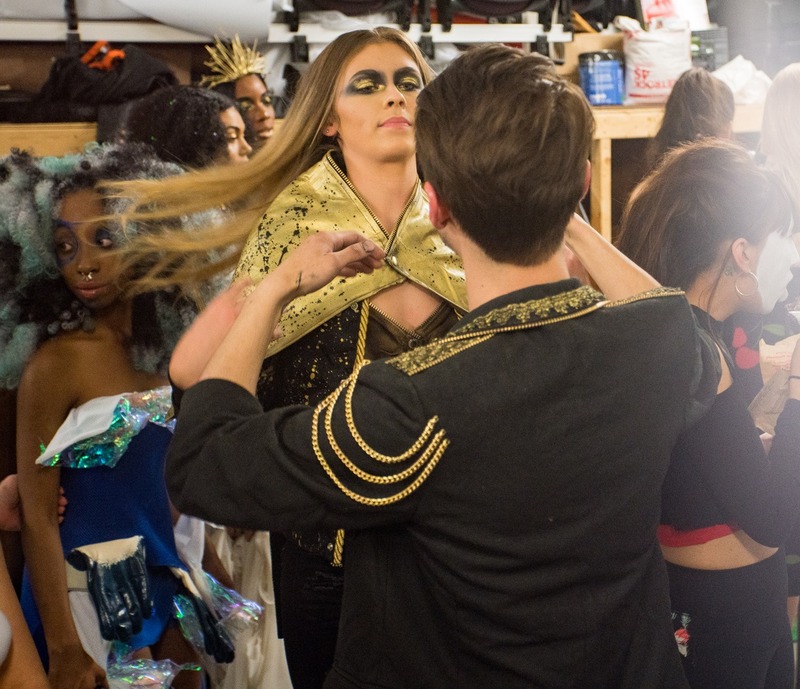 Toronto Drag Performer Scarlett Bobo in her custom vegan leather two piece set, styled with a neon green styled denim jacket, splattered with 18k gold and black paint. 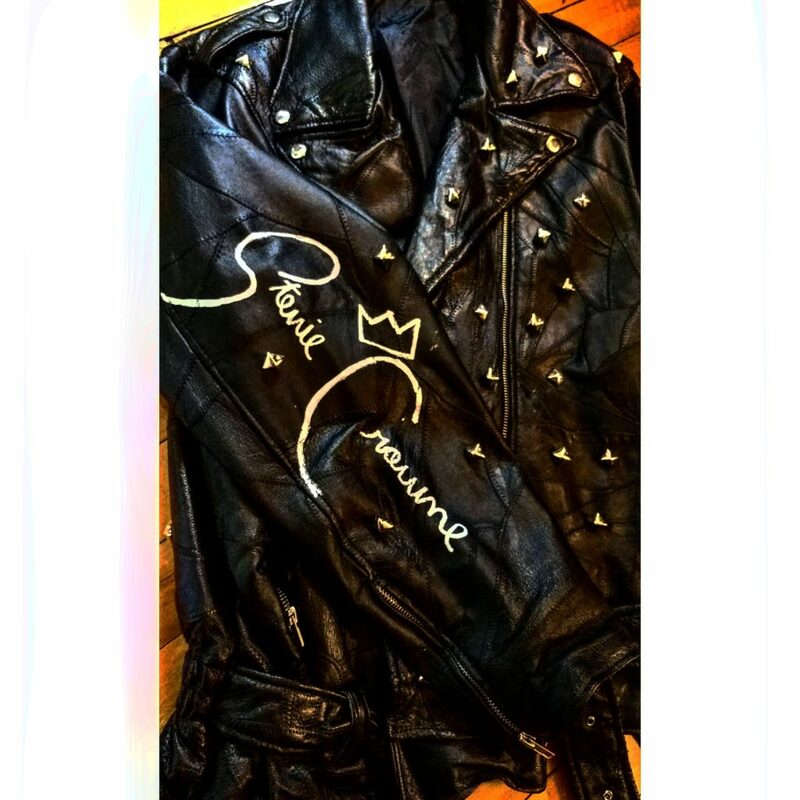 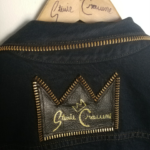 Custom quilted leather jacket with silver pyramid embellishments, side arm chain detail, signature logo on sleeve, and an embellished crown on the back. 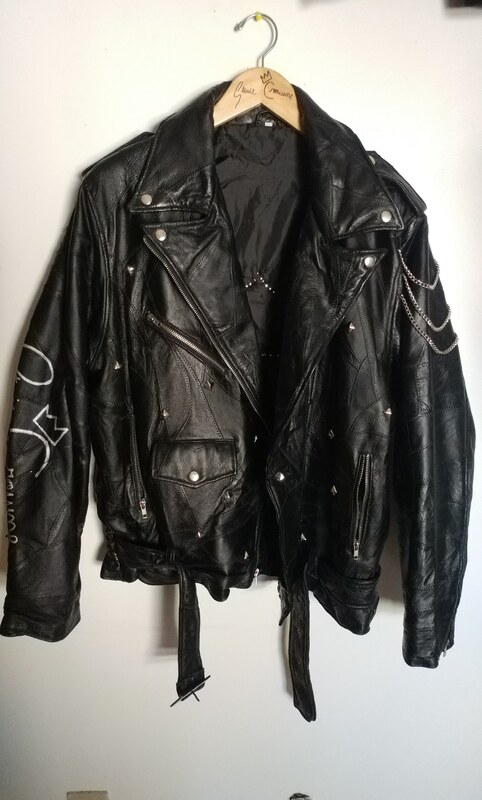 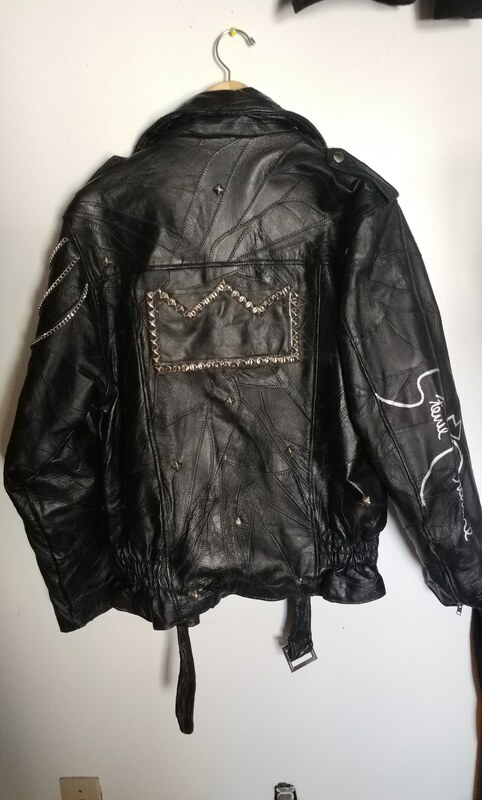 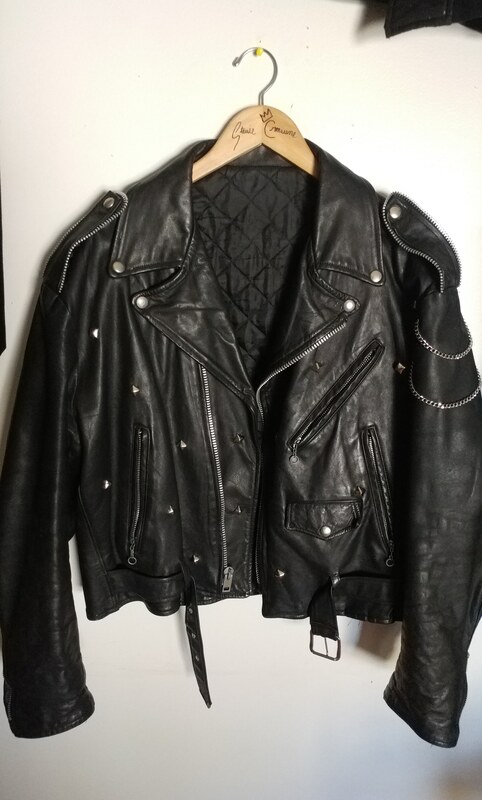 Custom leather biker jacket with 10c YKK Silver zipper trim on epaulets, side chain detail, and pyramid stud embellishments scattered across the front and crown on back. 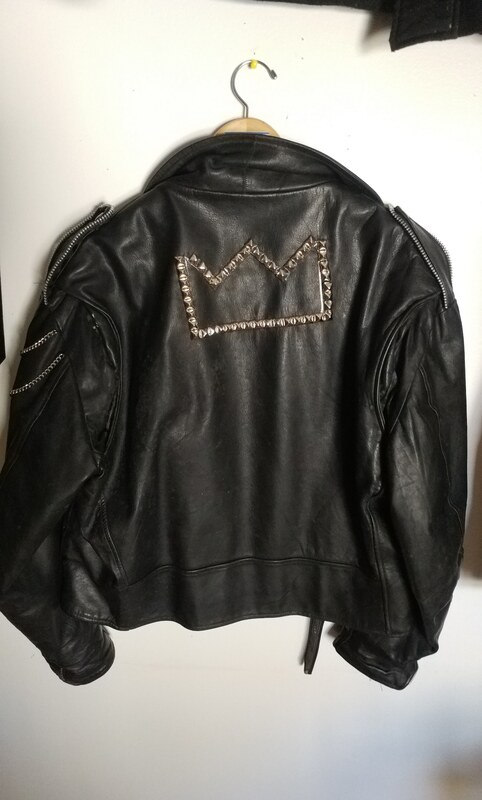 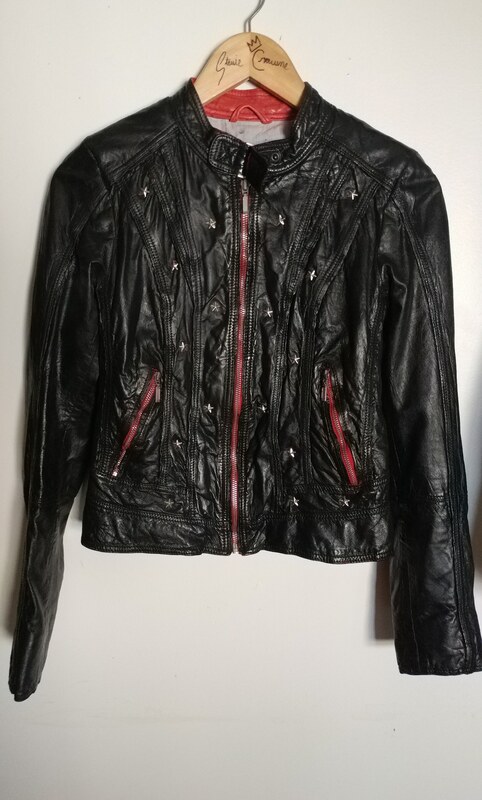 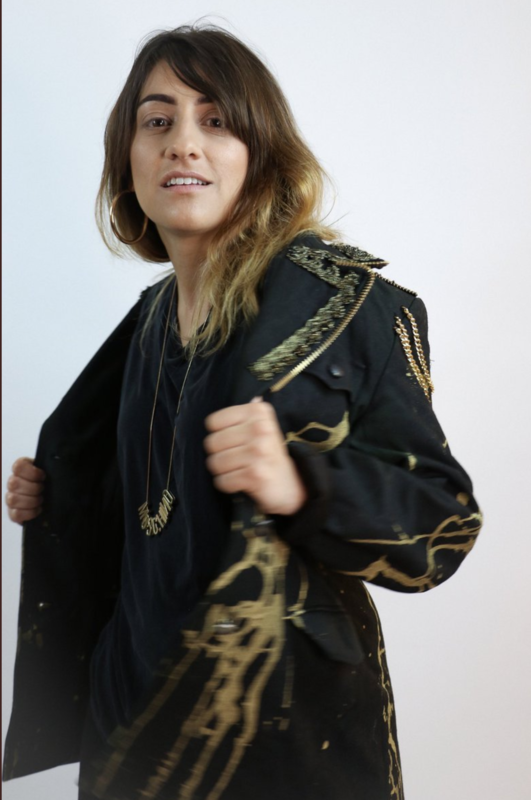 Custom vegan leather jacket, painted black from red and embellished with silver star studs. 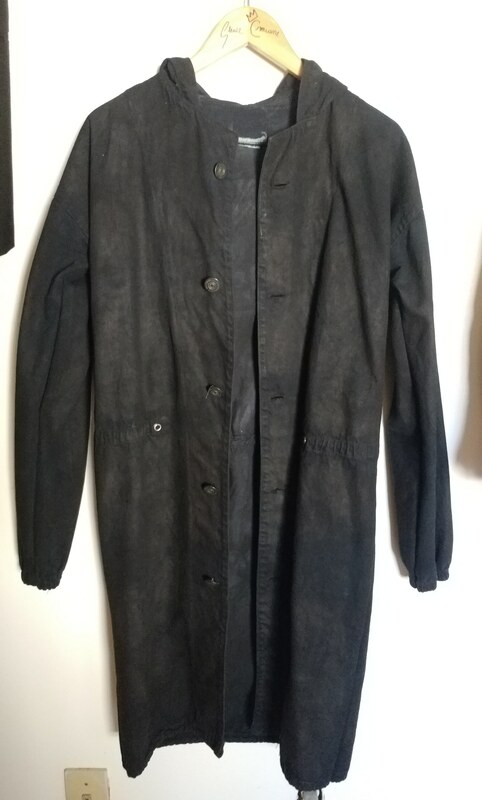 Denim trench coat, dyed black and waxed, tailored with an industrial crown patch with logo on back. 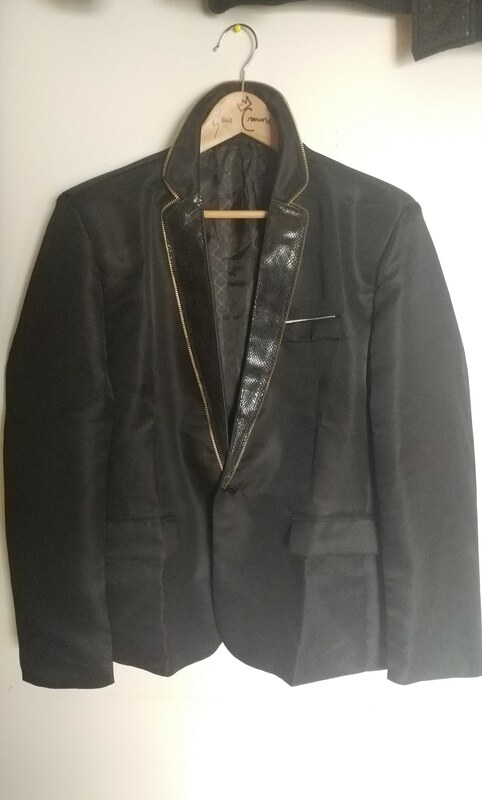 Classic black blazer with black snakeskin leather revere detail, trimmed with gold zipper embellishments. 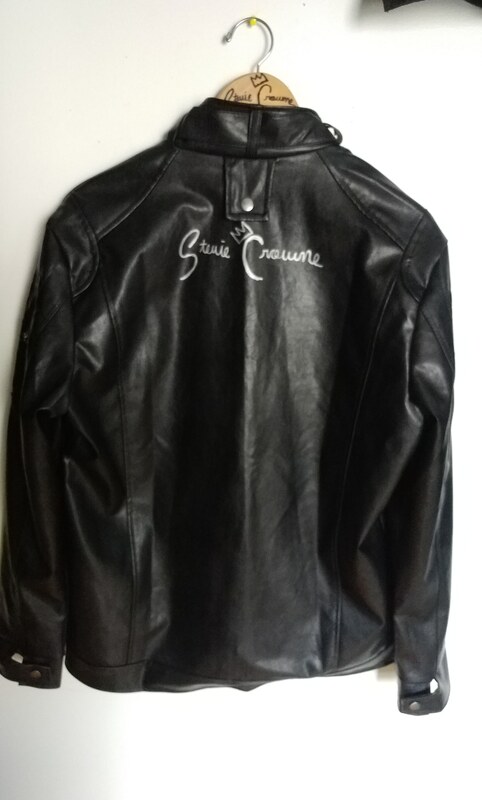 Classic leather bomber jacket, signed on the back. 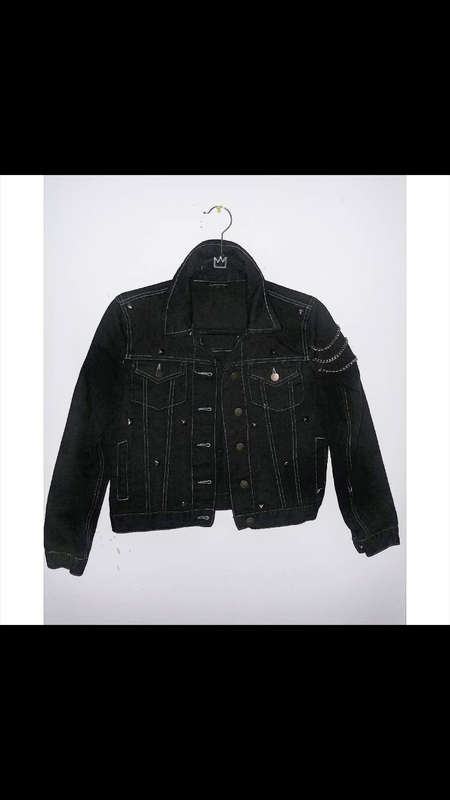 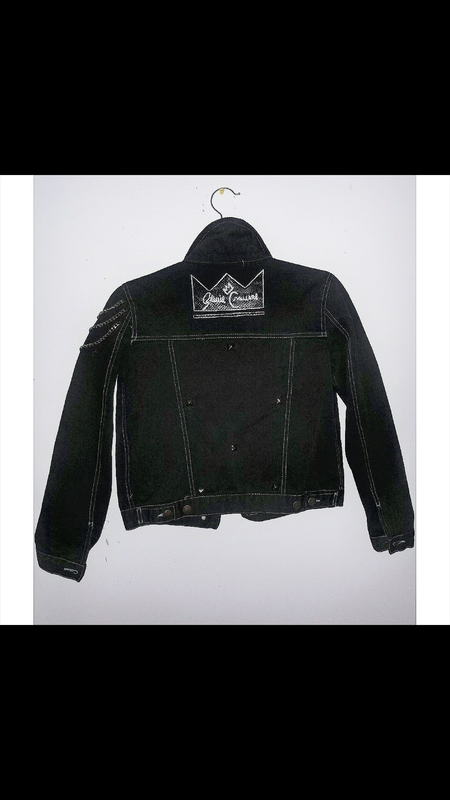 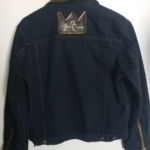 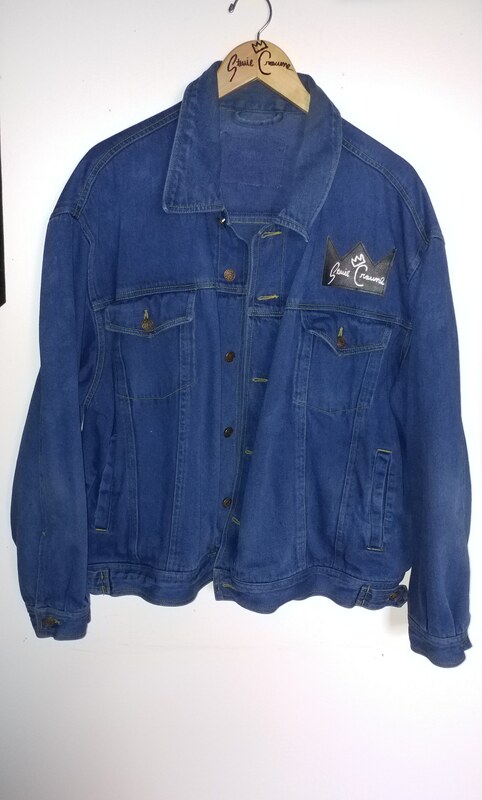 Classic denim jacket, dyed a dark navy with a front left chest crown signature motif patch. 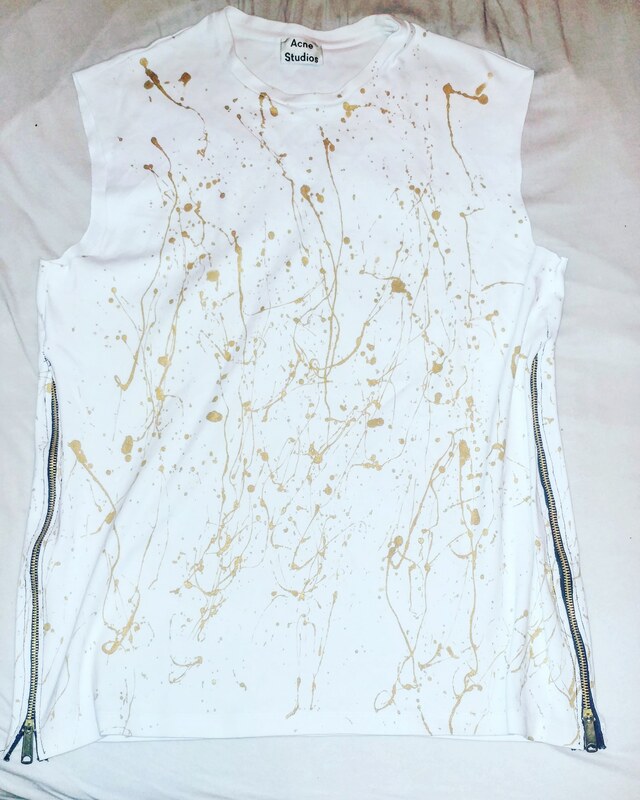 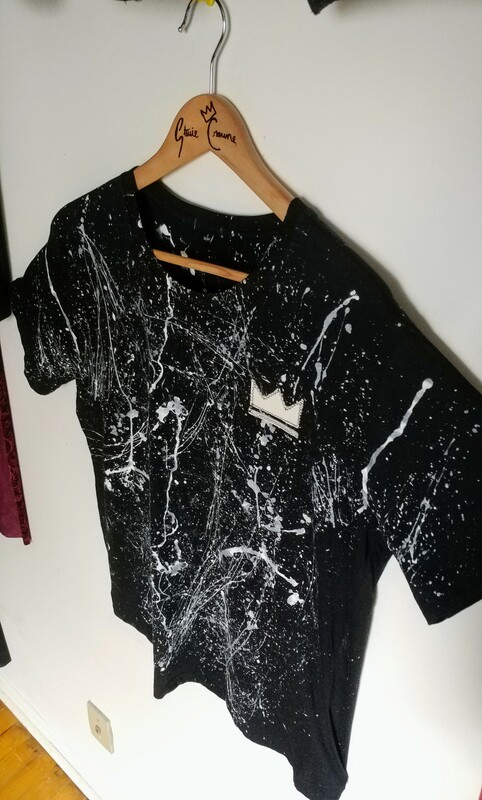 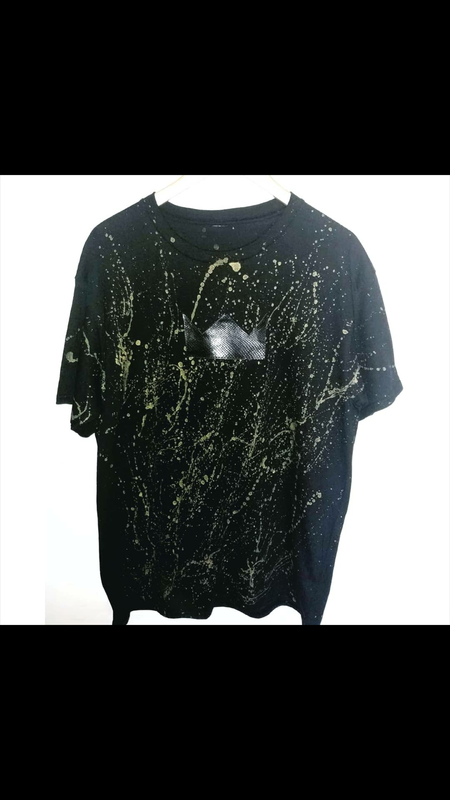 Black cotton splattered t-shirt with white leather crown motif. 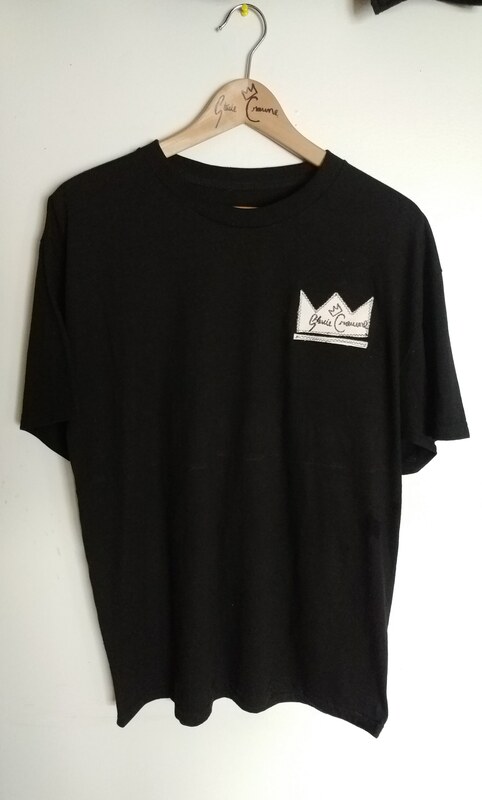 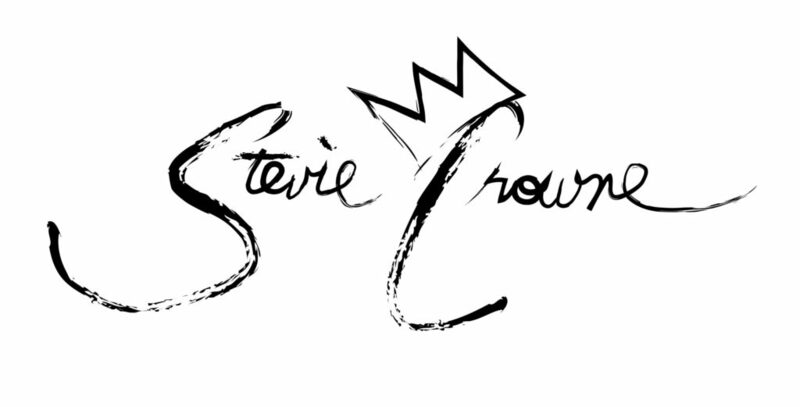 Black cotton t-shirt with signature crown motif. 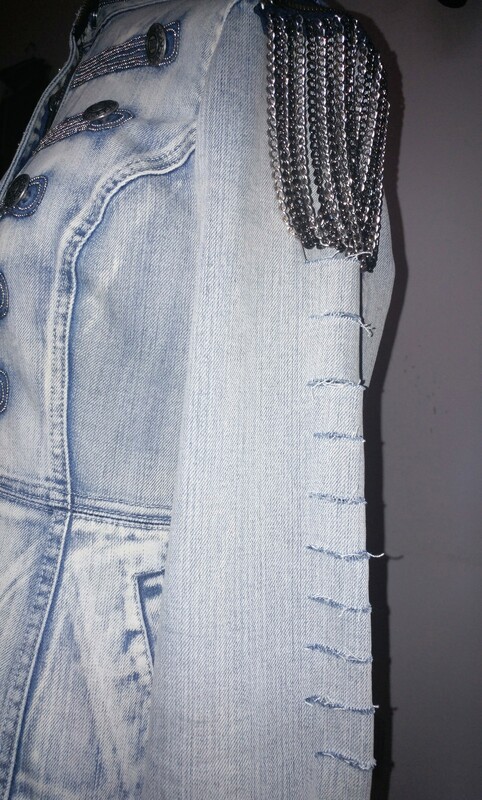 Finished with a zigzag trim stitch. 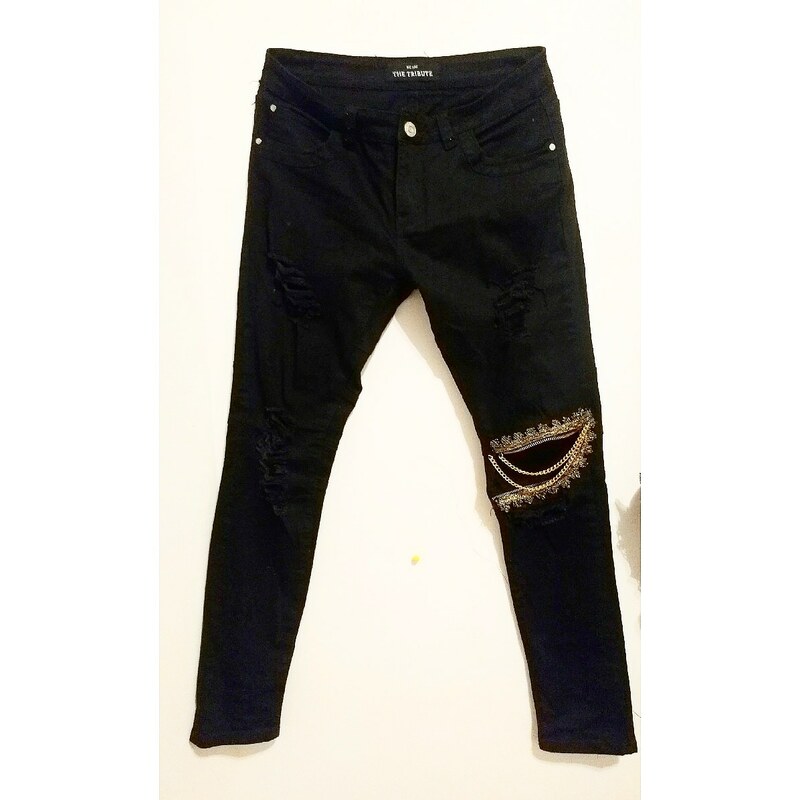 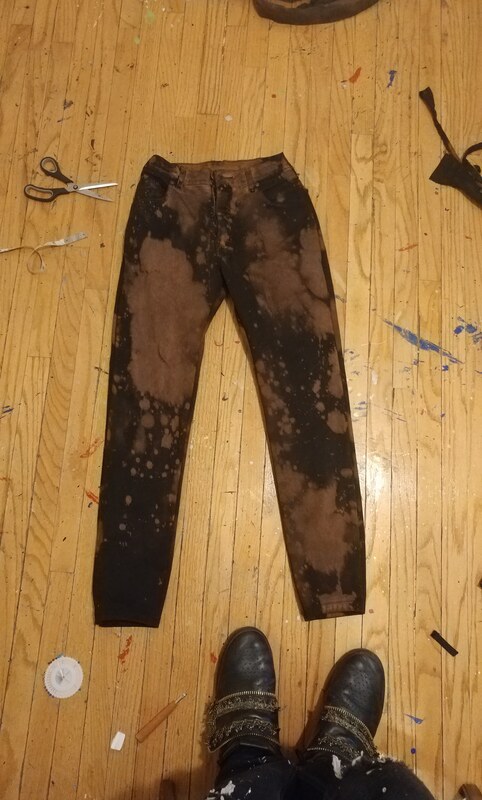 From the cutting room floor: black acid wash dyed denims, tailored to the client. 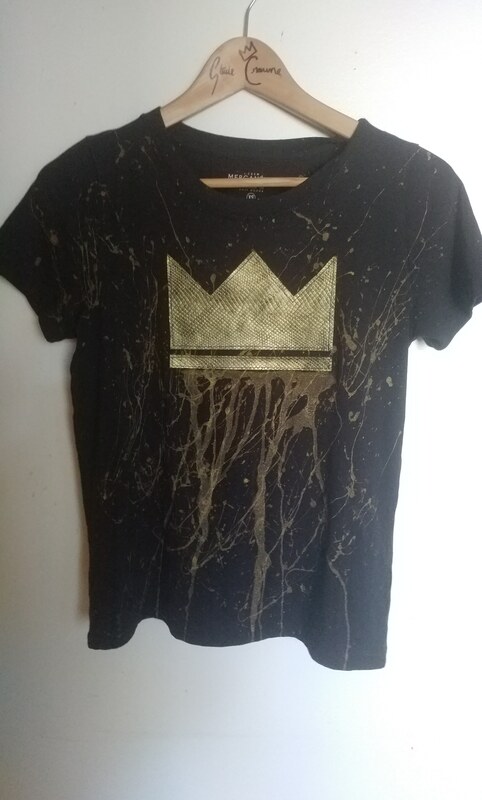 Black cotton t shirt with 18k gold painted leather snakeskin motif, incorporate d with 3D metallic pigments. 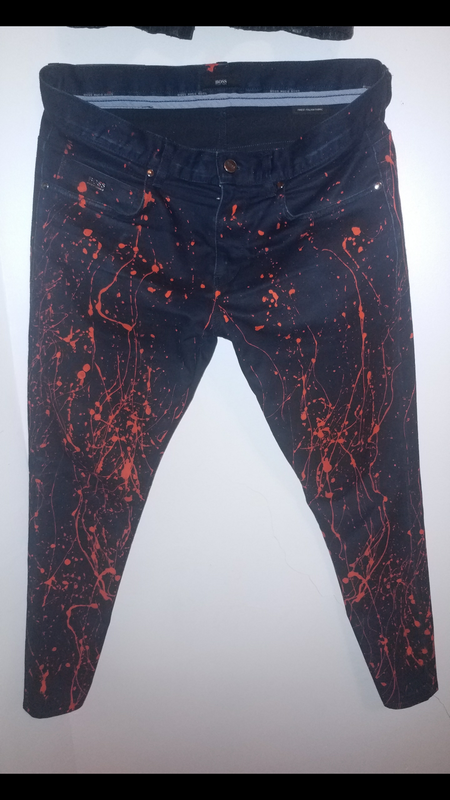 Splatter + drip techniques were incorporated. 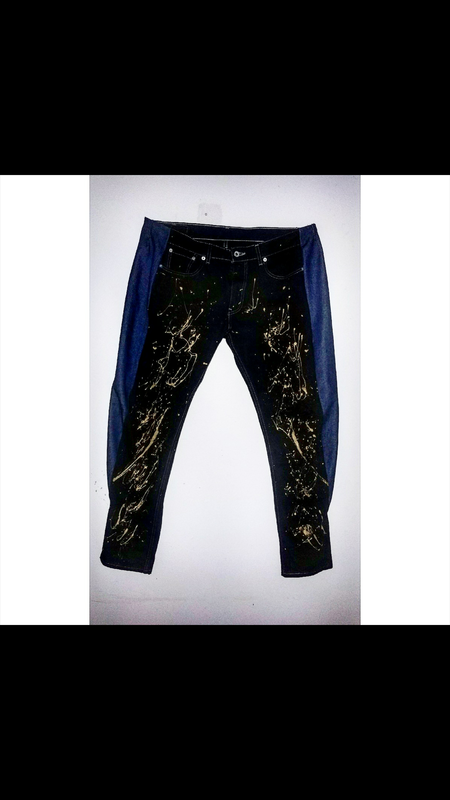 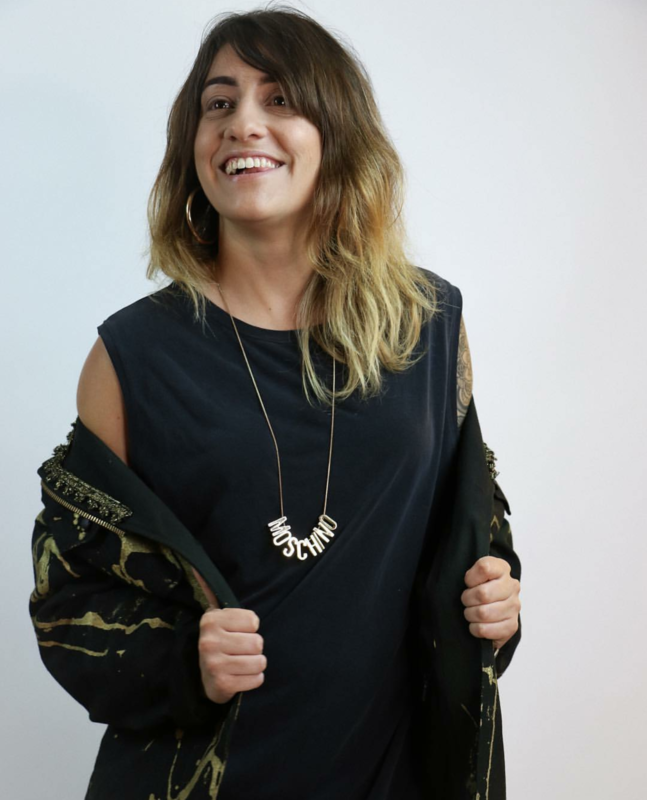 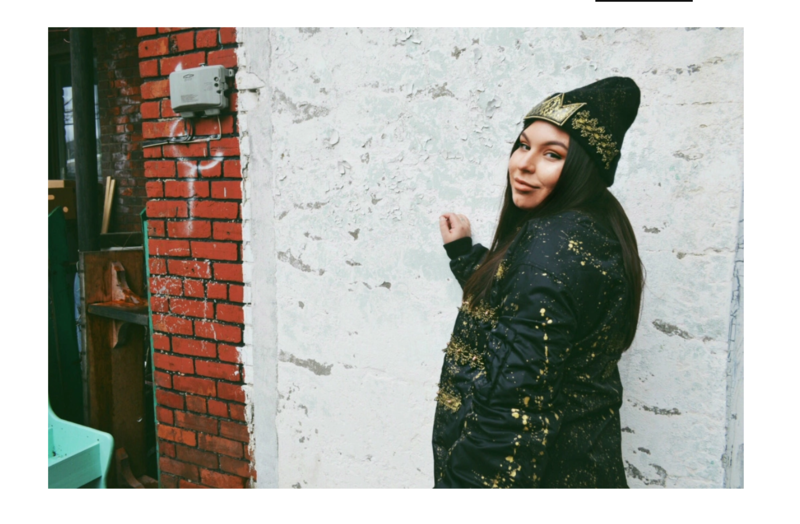 Matching denim, with washed out gold splatter and accenting black snakeskin strips up the sides and mild distressing. 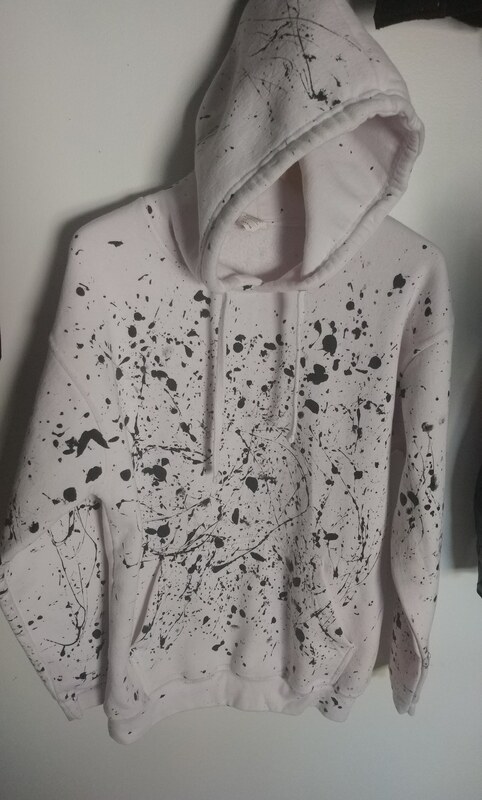 Oversized white hoodie with black splatter print. 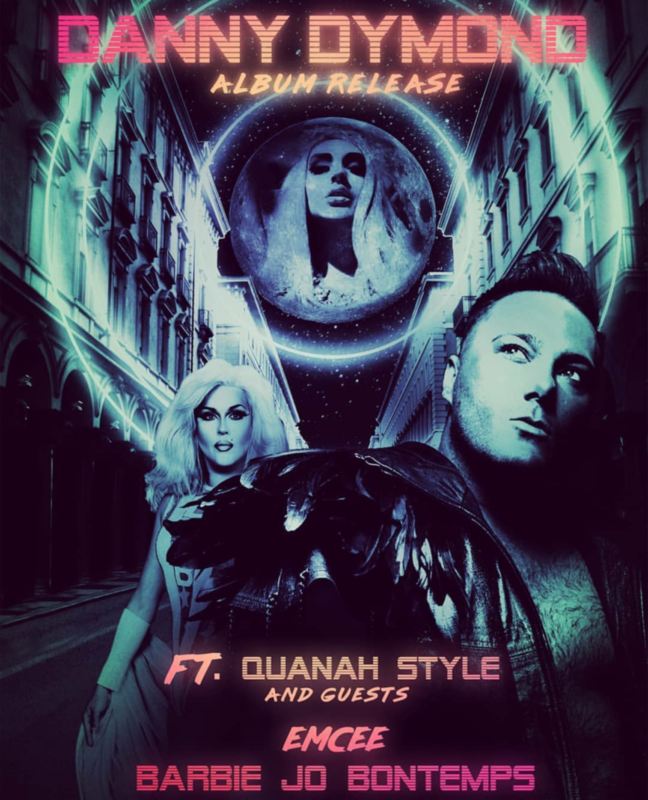 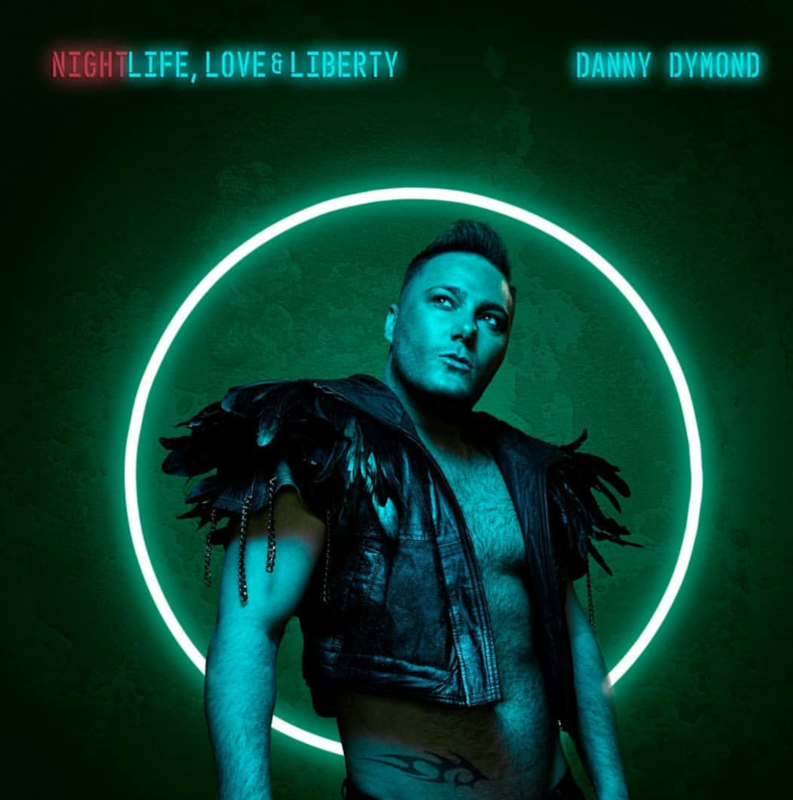 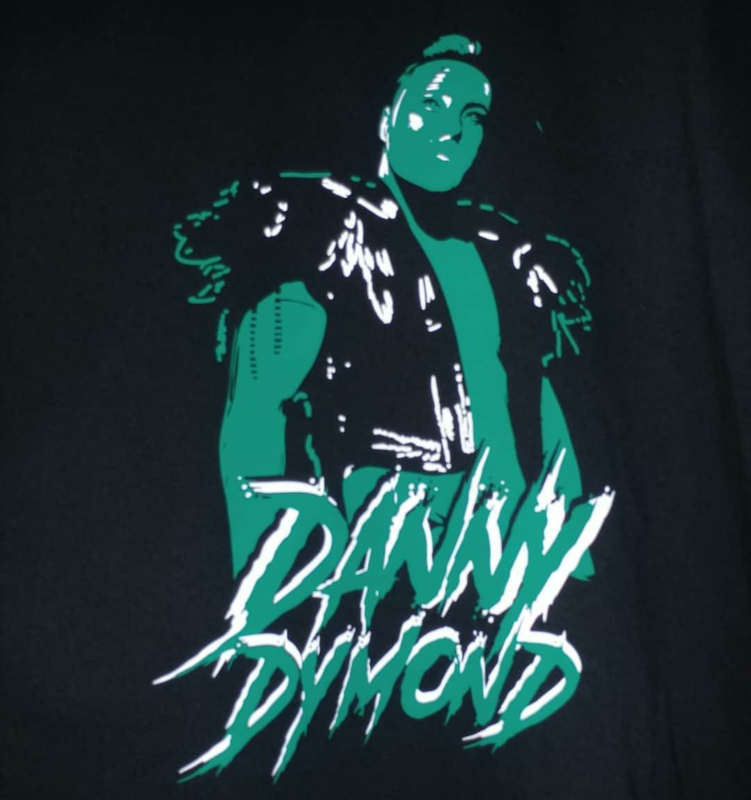 Congratulations to Danny Dymond for releasing his album, “Nightlife, Love, and Liberty” last night at The Hideout in Toronto. 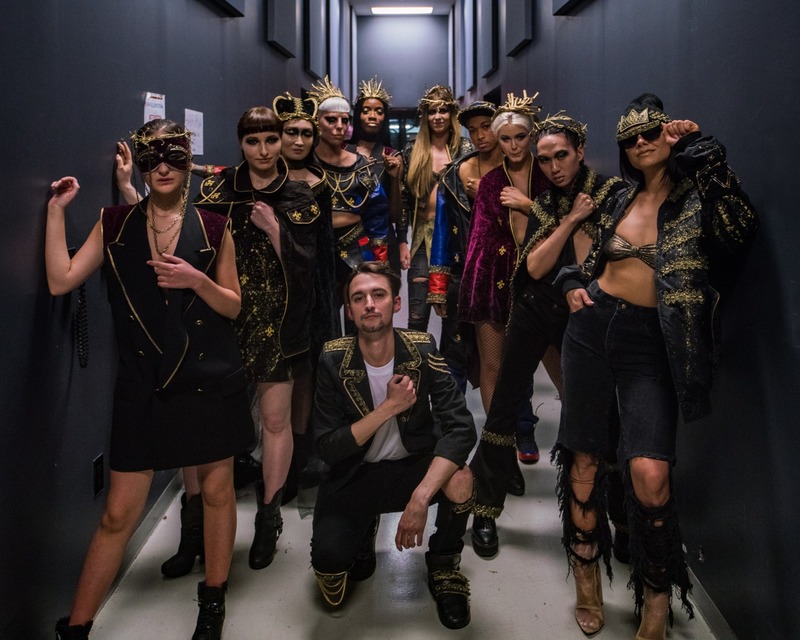 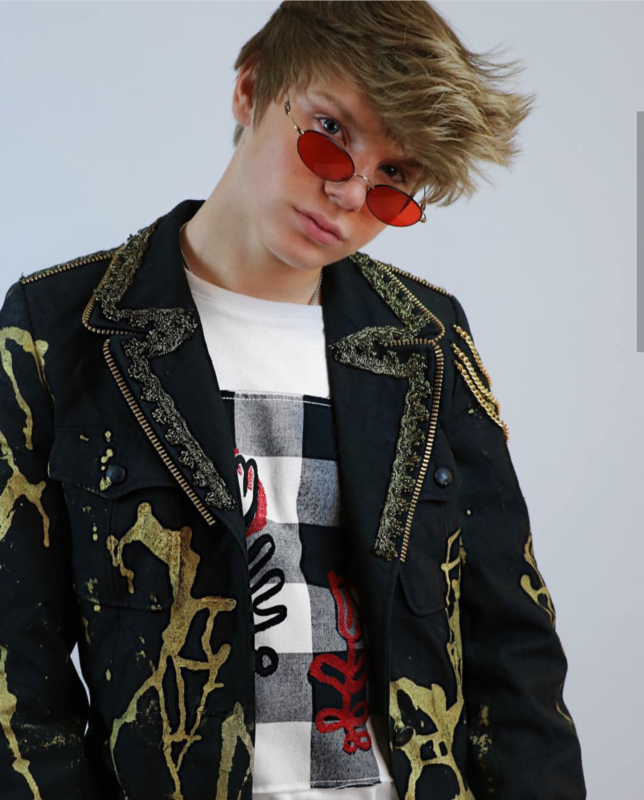 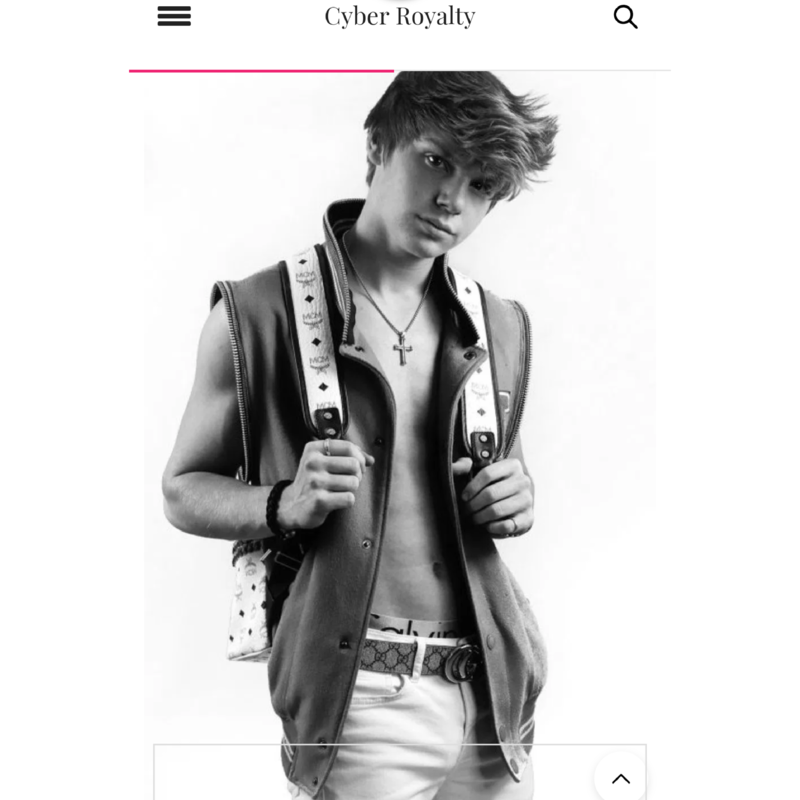 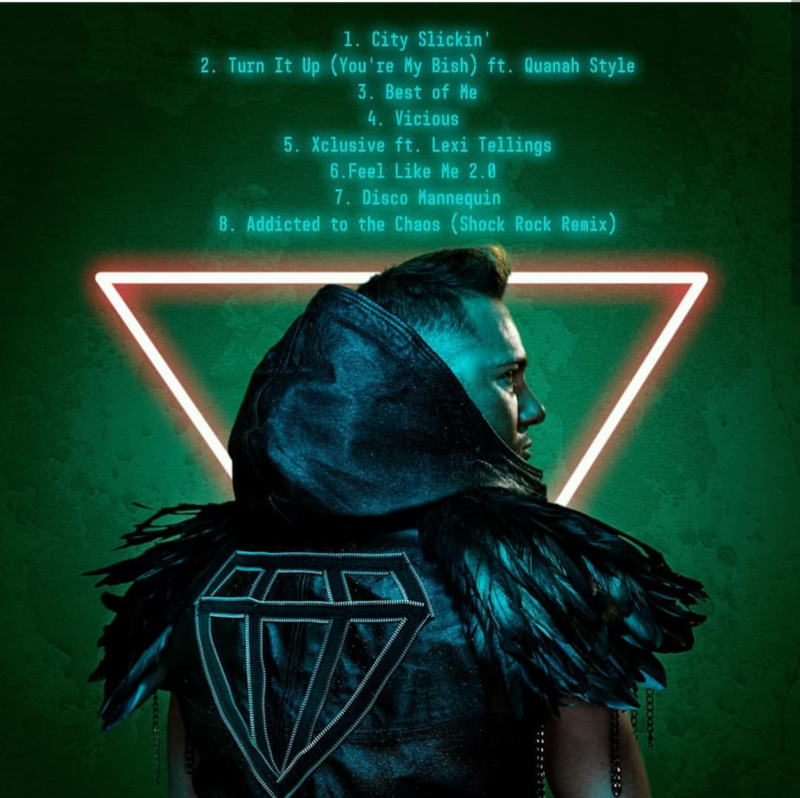 It has been so much fun to work on custom clothing for his stage performances this last year, and was a true honor to have my custom feather + chain embellished jacket with a specialized zipper diamond motif on the back make it onto his album artwork + tour merchandise. 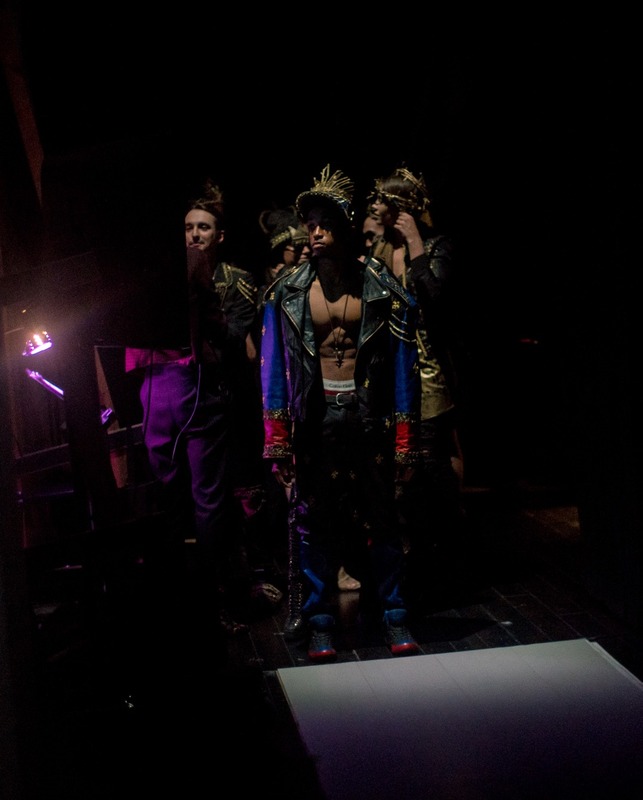 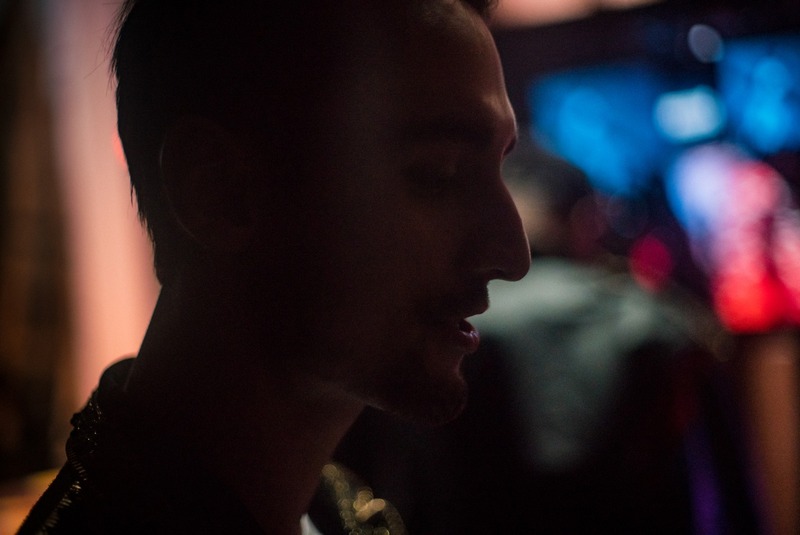 More photos coming soon of his performance, primarily wearing our collaboration pieces throughout. 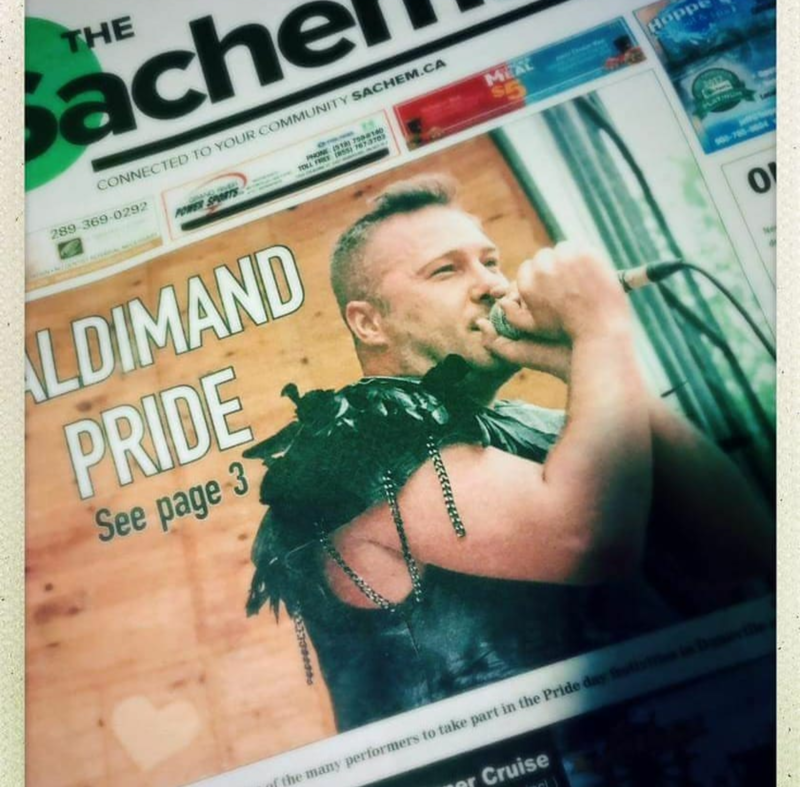 Also, here is a photograph of him in our custom look that made the front page of the newspaper in his hometown, where he performed proudly at a pride parade alongside fans and protesters. 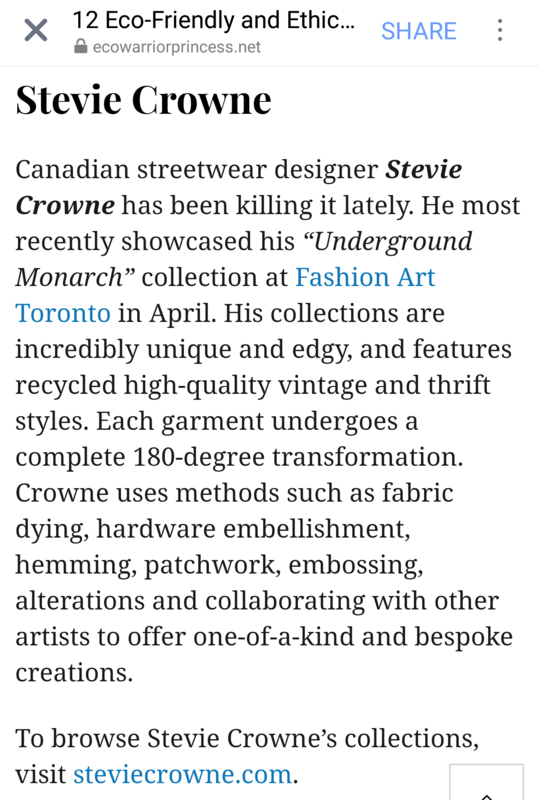 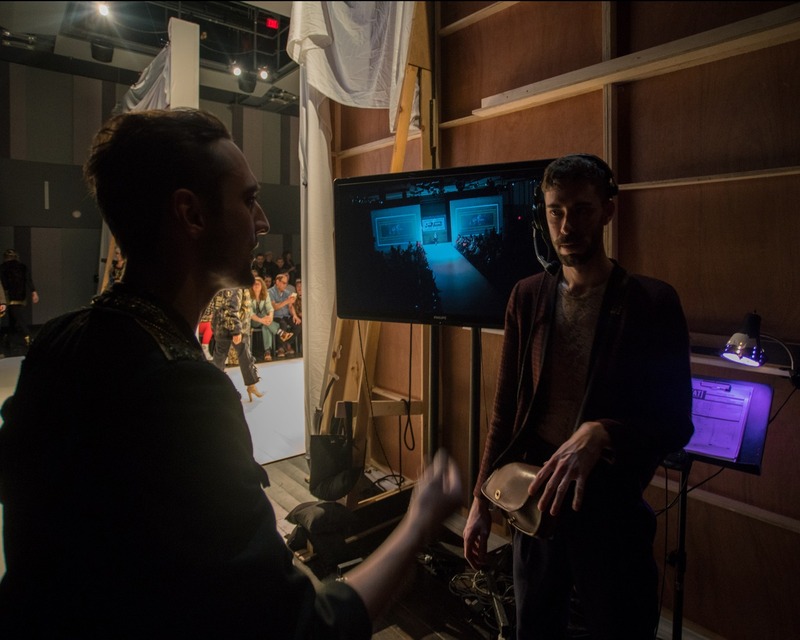 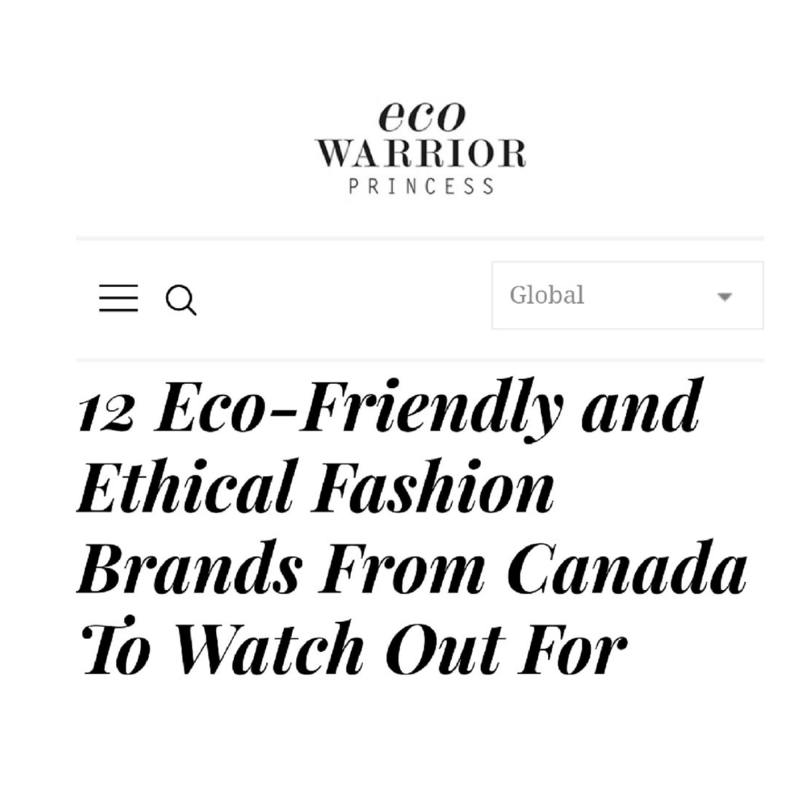 To be chosen among the top ten sustainable fashion designers two years in a row in Canada is truly humbling. 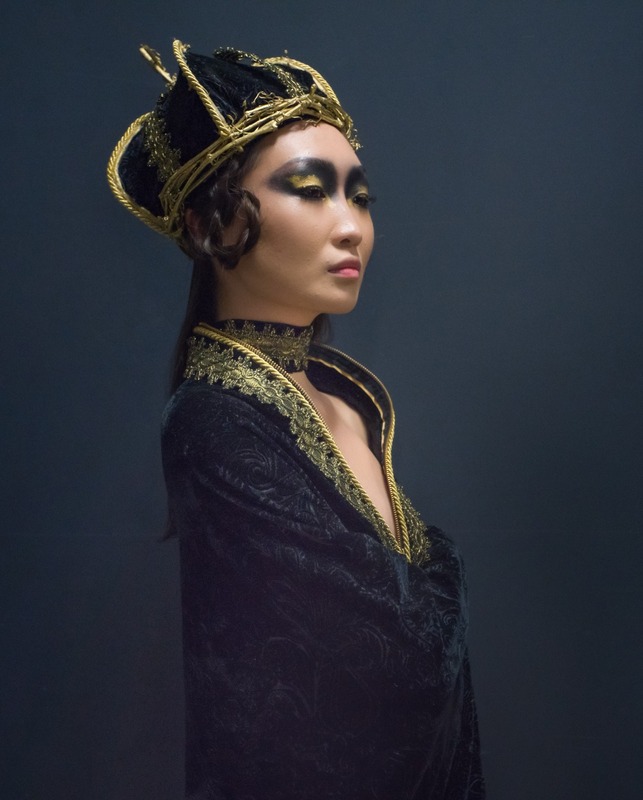 Congratulations to Obakki for taking the top prize.